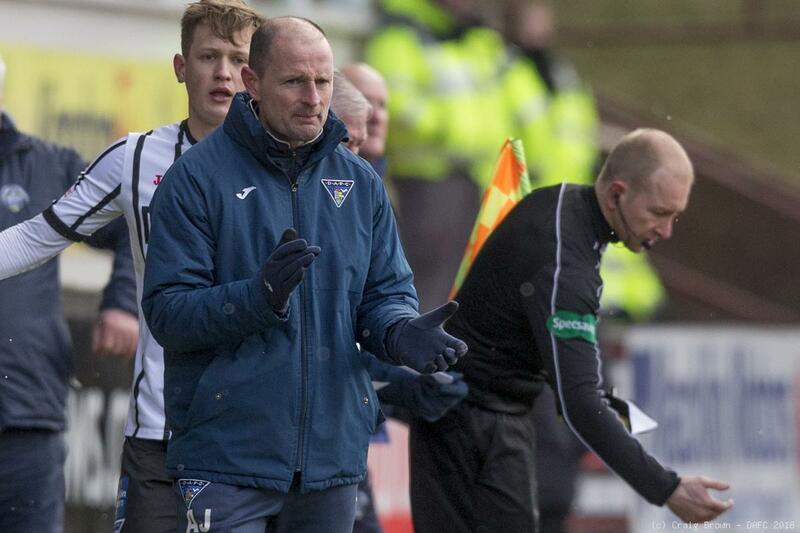 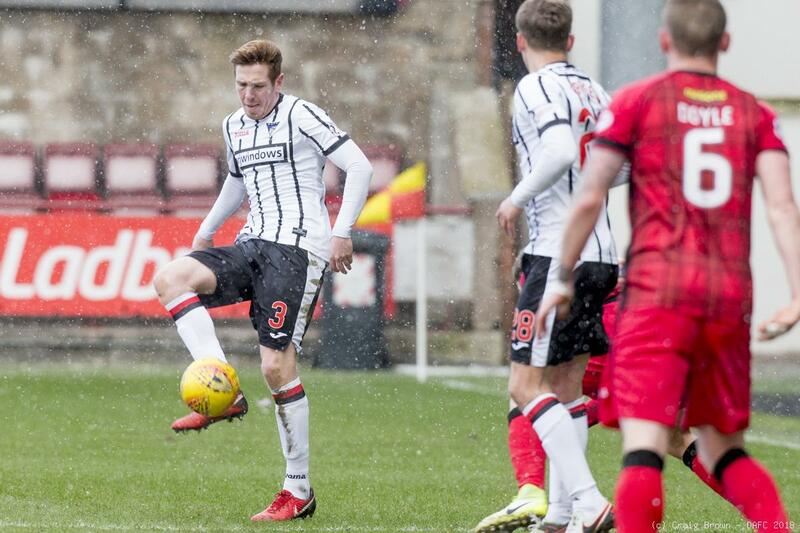 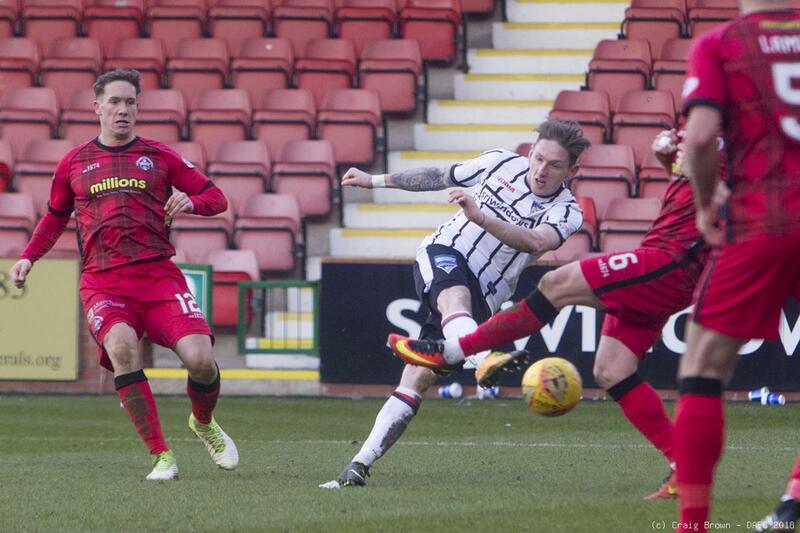 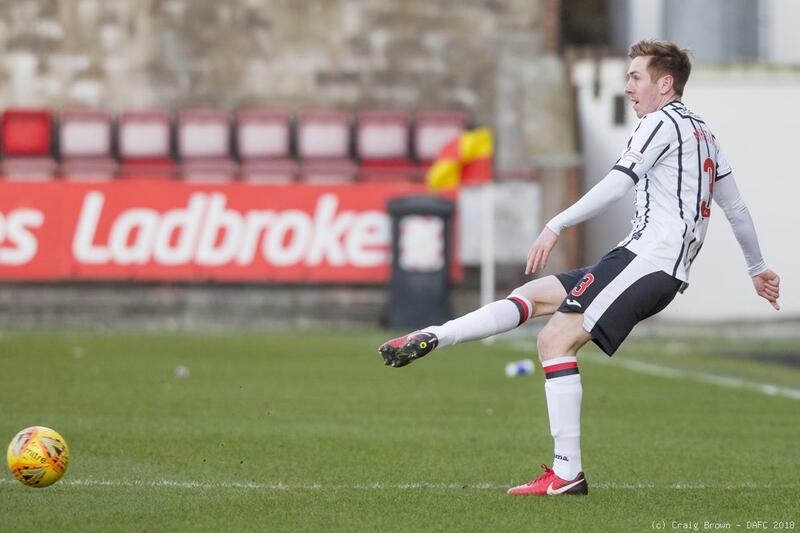 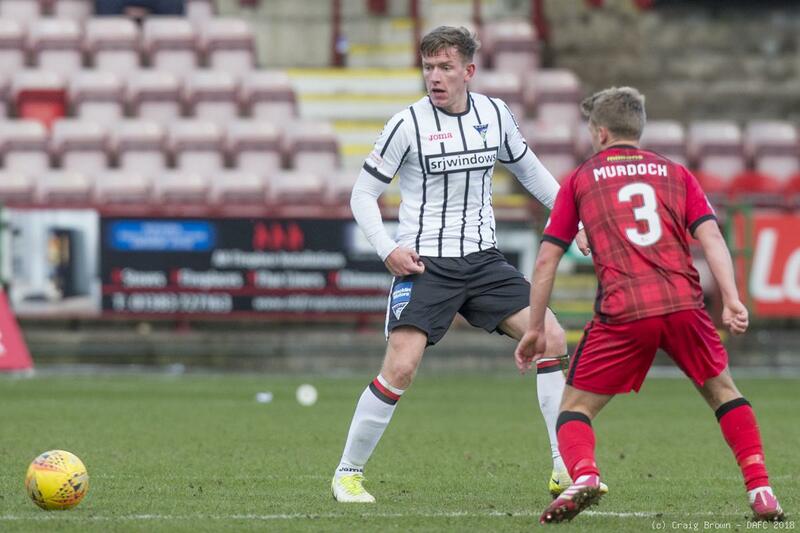 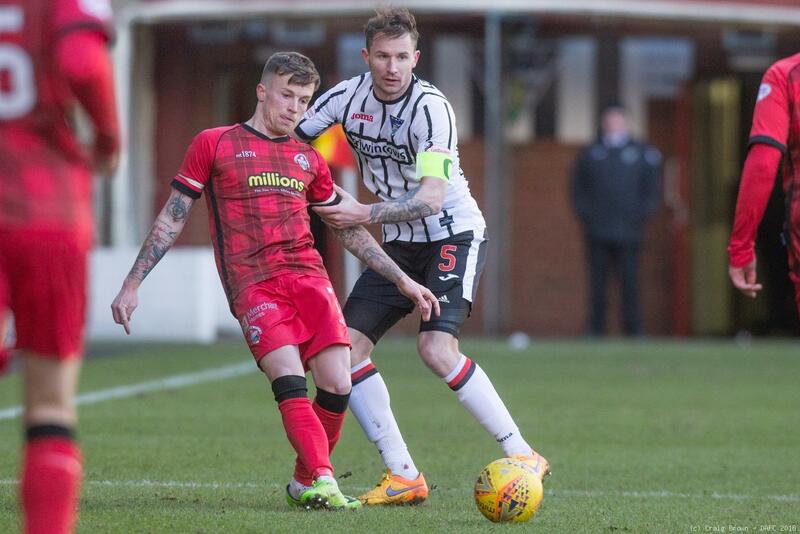 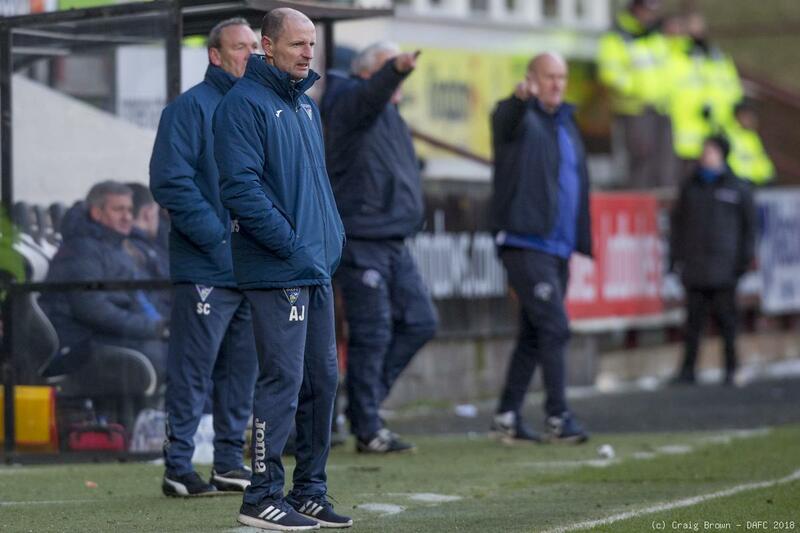 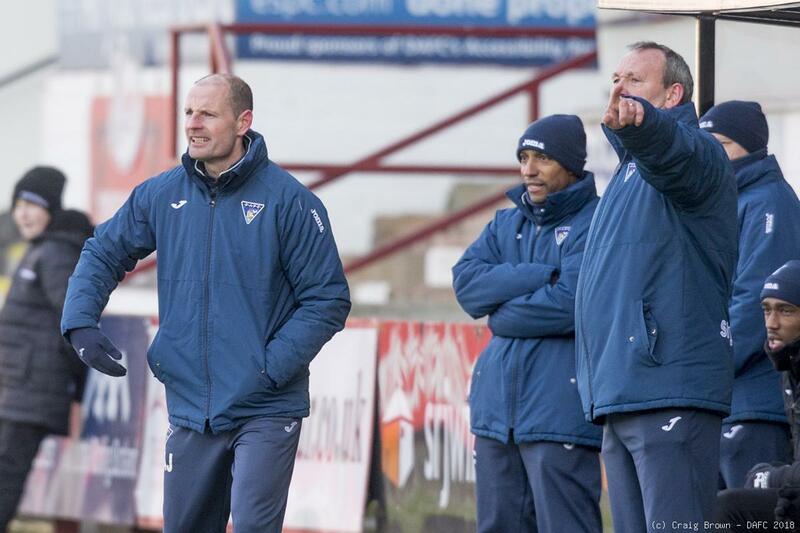 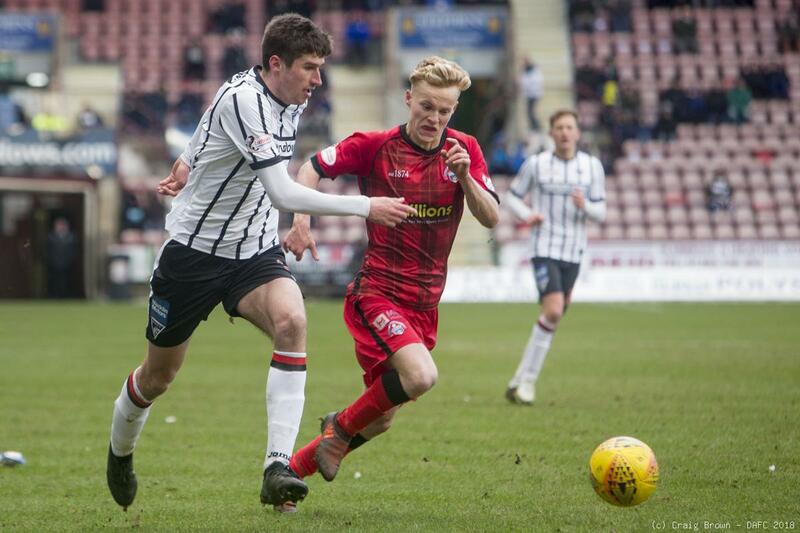 Dunfermline Athletic welcomed Morton to East End Park for the first Saturday league fixture there since 13th January. 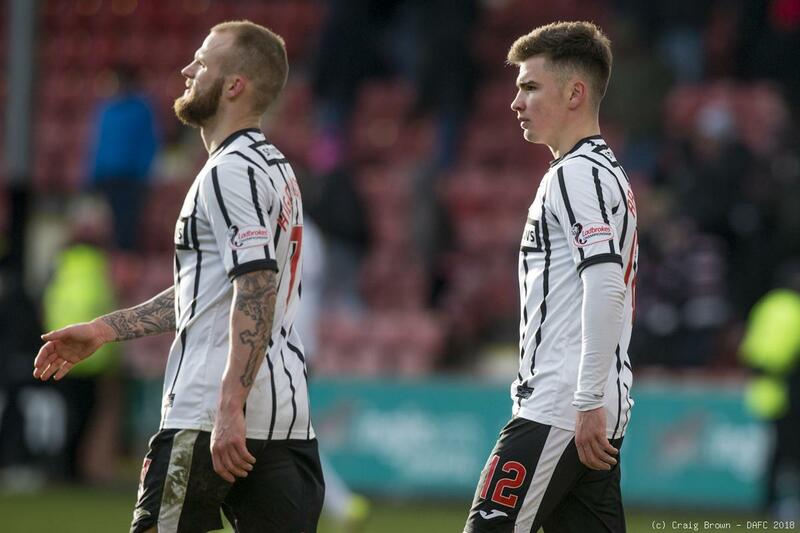 A win would see the fifth placed Pars close the gap on the team immediately above them to just one point. 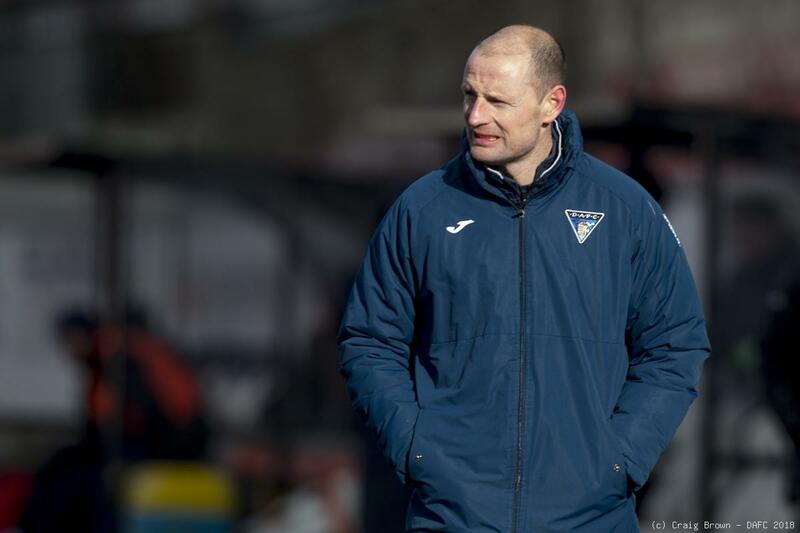 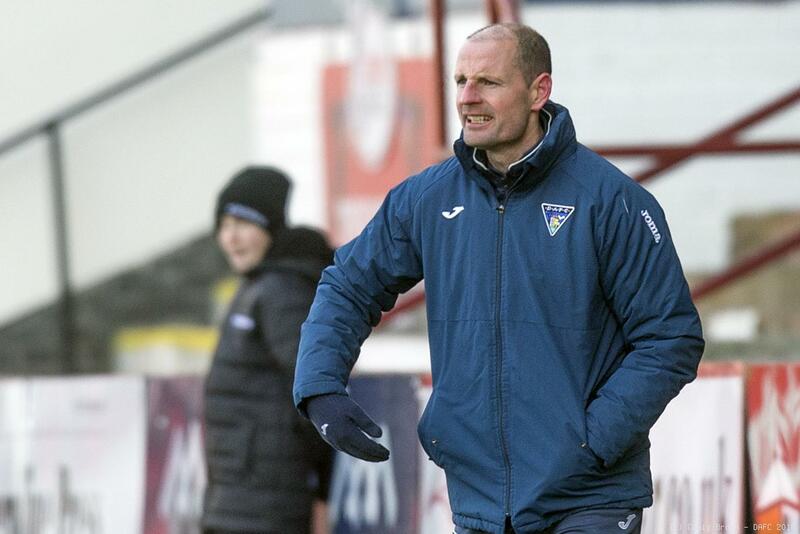 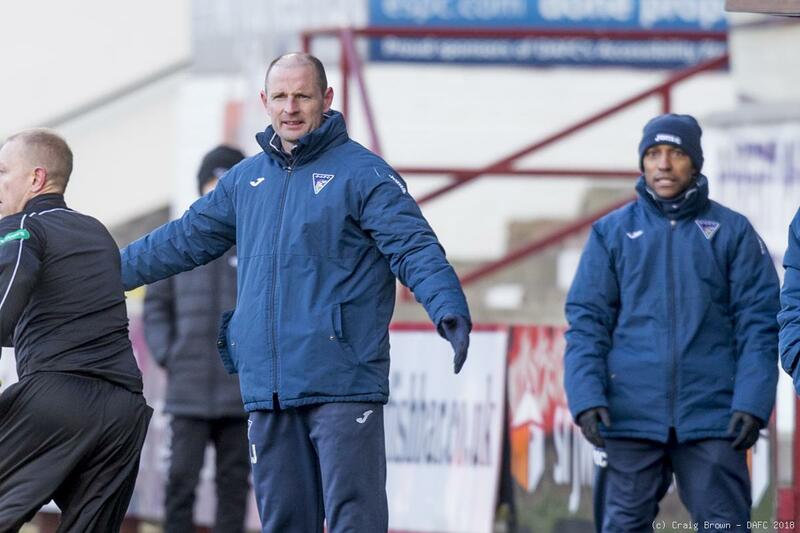 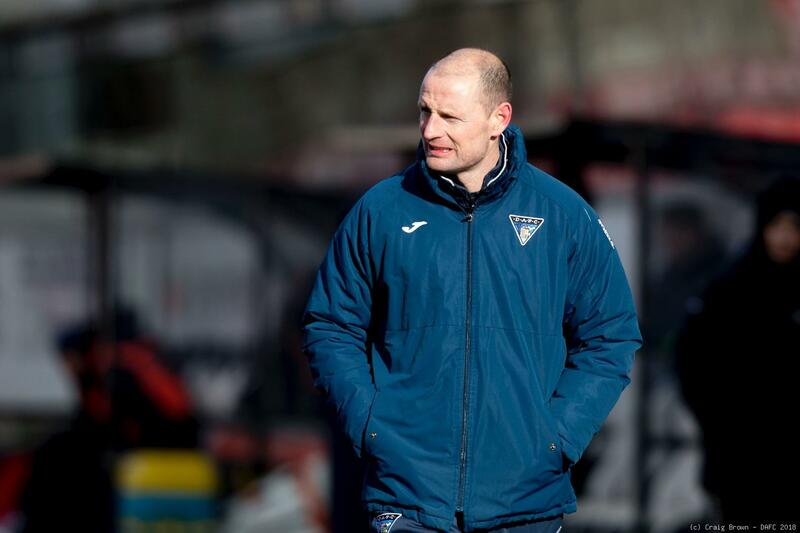 Manager Allan Johnston named the same eleven that defeated Inverness Caley Thistle on Tuesday night and the bench saw Andy Ryan and Scott Lochhead drop out to make way for Jean-Yves M’Voto and Jason Talbot. 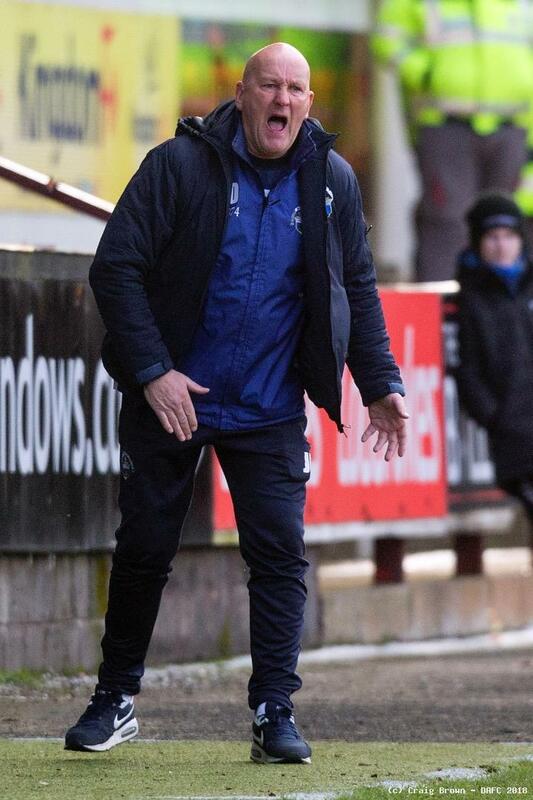 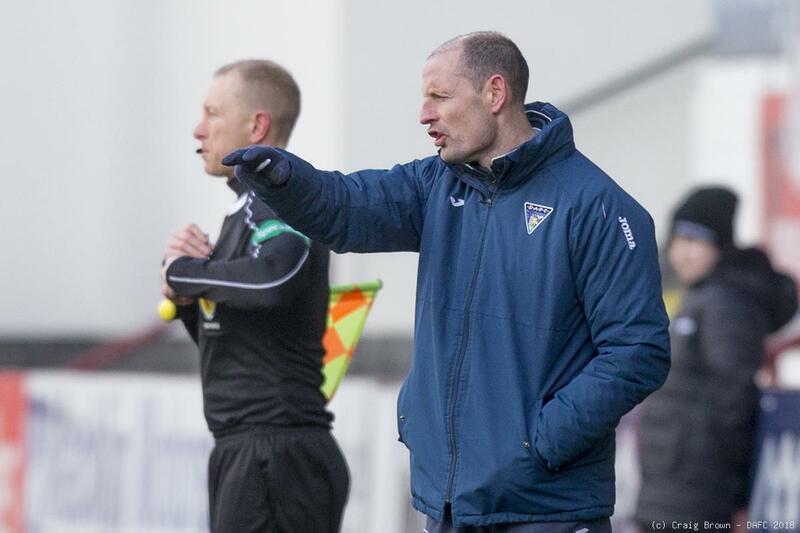 Morton gaffer Jim Duffy brought Michael Doyle back in having served his suspension meaning Mark Russell was on their bench. 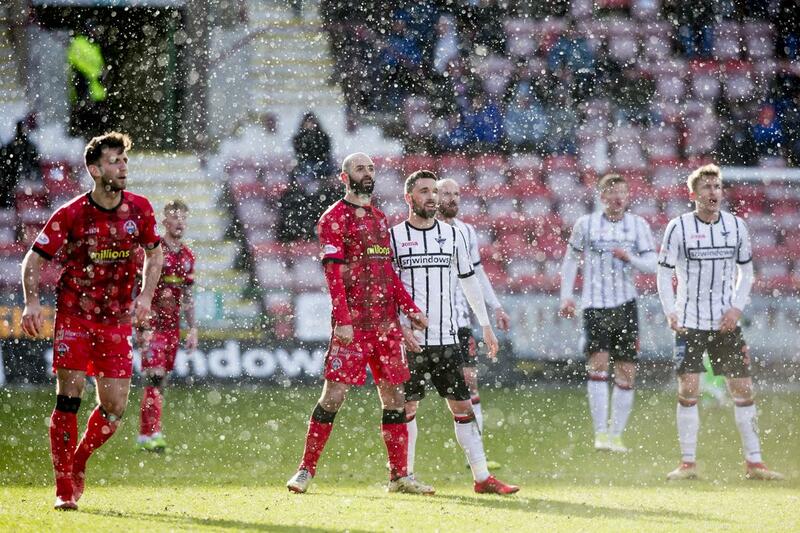 Snow blew through the air as the teams warmed up, there was a glimpse of bright sunlight before the teams re-emerged but that had gone as the teams changed ends and Nicky Clark kicked off. 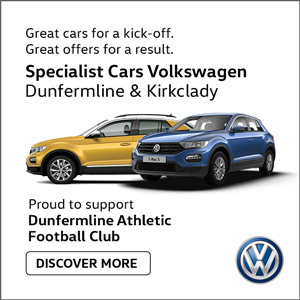 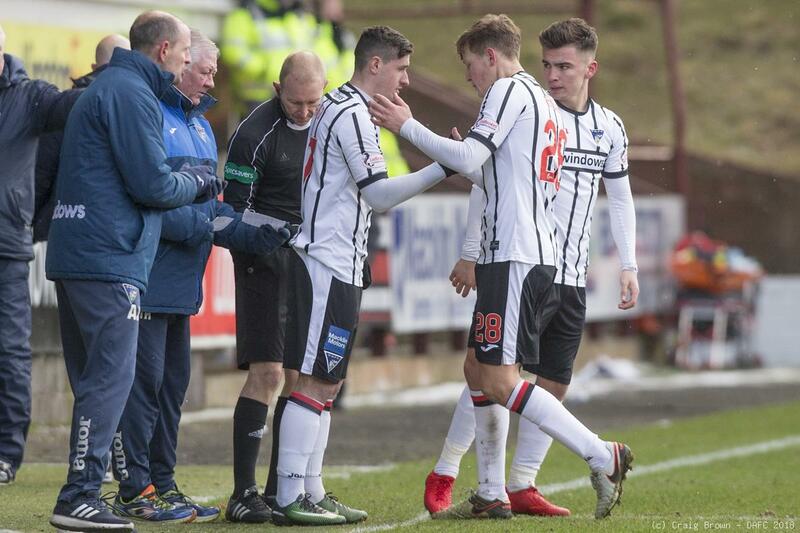 Within 30 seconds Declan McManus drive to the top of the visitors box and back heeled the ball for Clark to shoot low on target but Derek Gaston’s first task was to dive to his left to save. 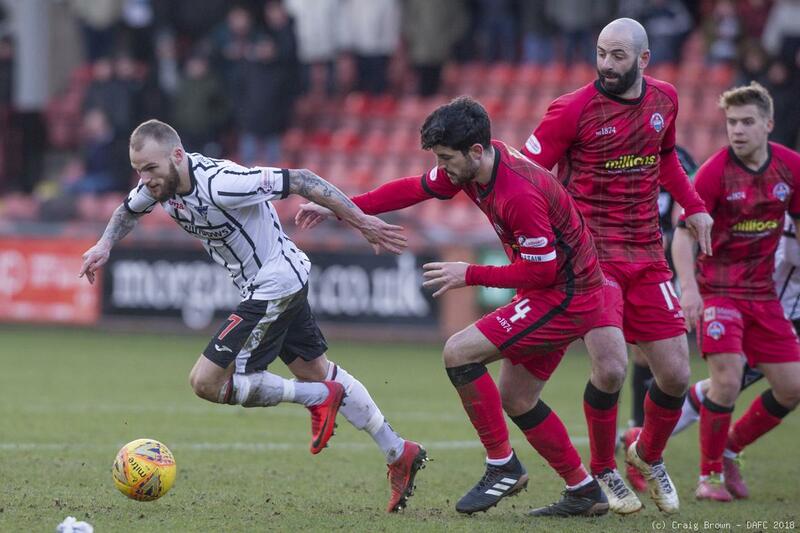 There was a lot of good early pressure from the home side with Kallum Higginbotham and Ryan Williamson being very involved. 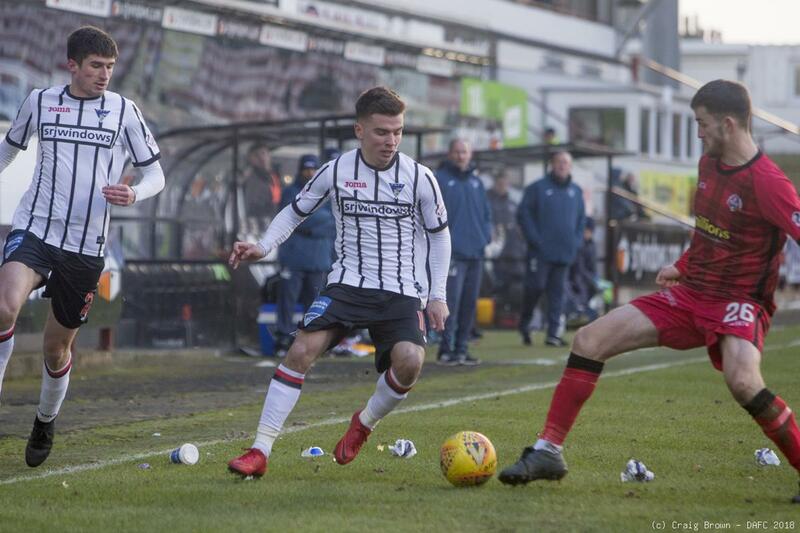 Morton were kept well away from Lee Robinson’s goal until ninth minute when Frank Ross broke in on the left side of the Pars box and although his final ball was intercepted by Callum Morris, Jack Iredale crashed the ball high over the bar from 25 yards out. 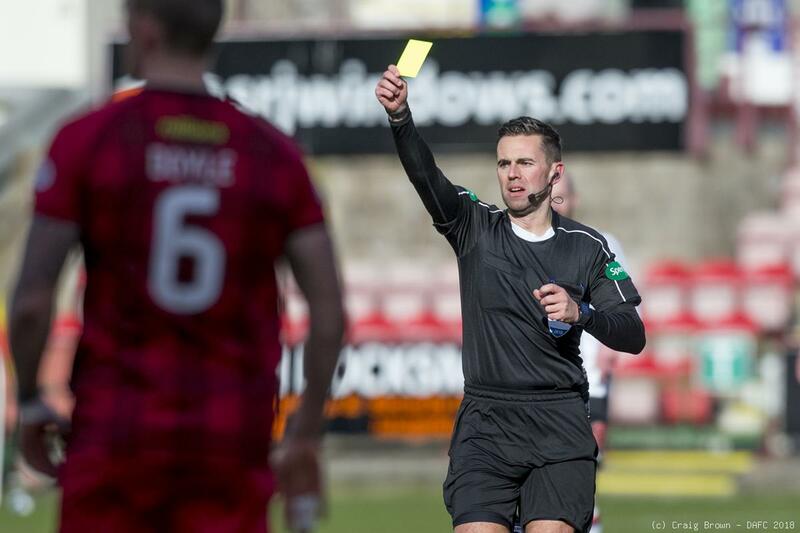 Morton captain Tom O’Ware was shown the first yellow card of the afternoon for hauling down McManus 30 yards out as he attempted a break. 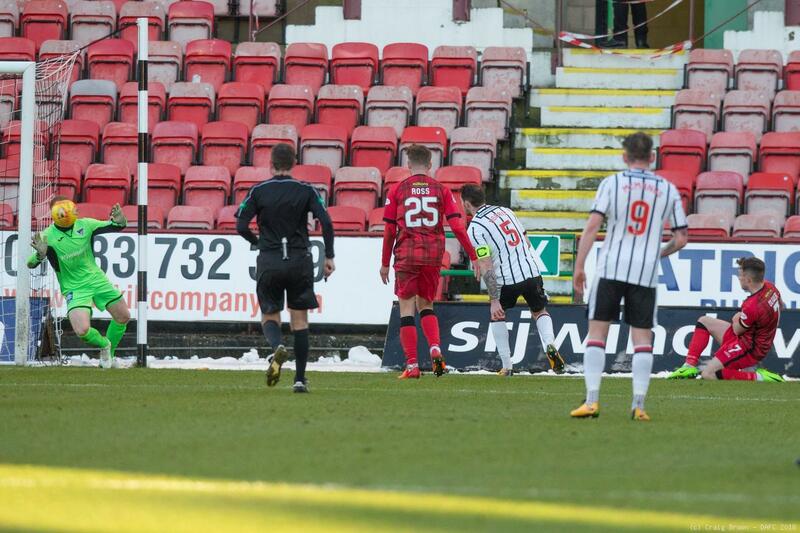 Unfortunately Higginbotham’s 11th minute free kick was over hit. 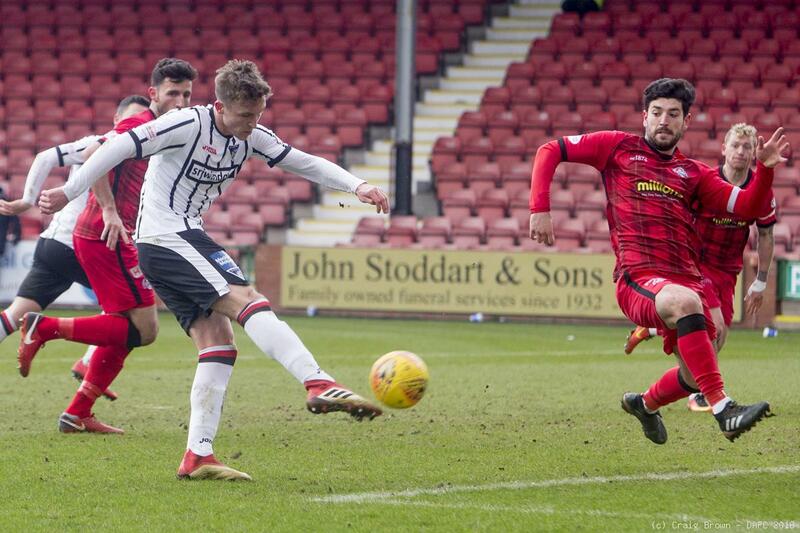 Five minutes further on and a James Craigen’s long ball from midway inside his own half was gathered by Clark but he lost control in the box as two defenders closed him out. 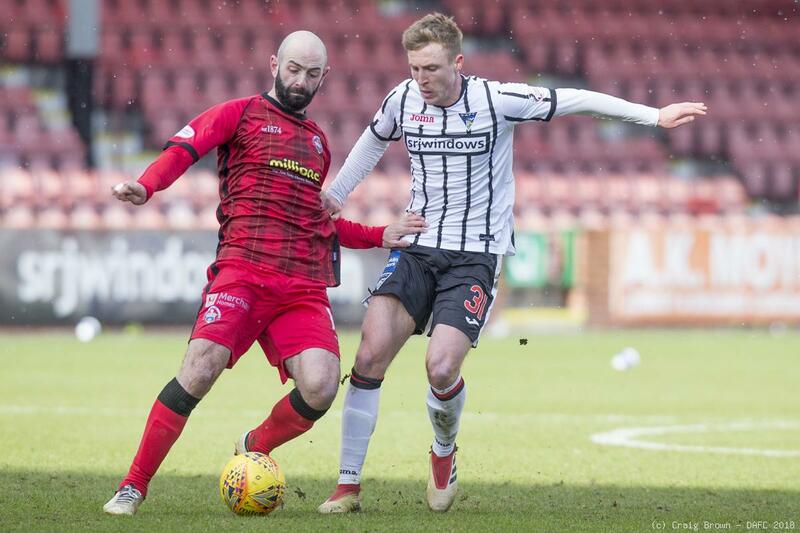 Gary Harkins drove forward in 20 minutes playing the ball off Gary Oliver and then feeding Ross on the left side of the box. 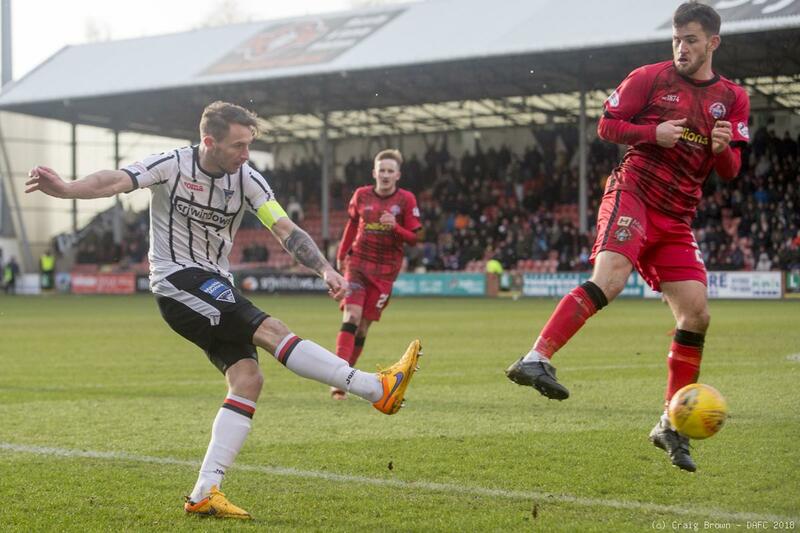 The on loan Don fired a powerful shot on the angle but was off target. 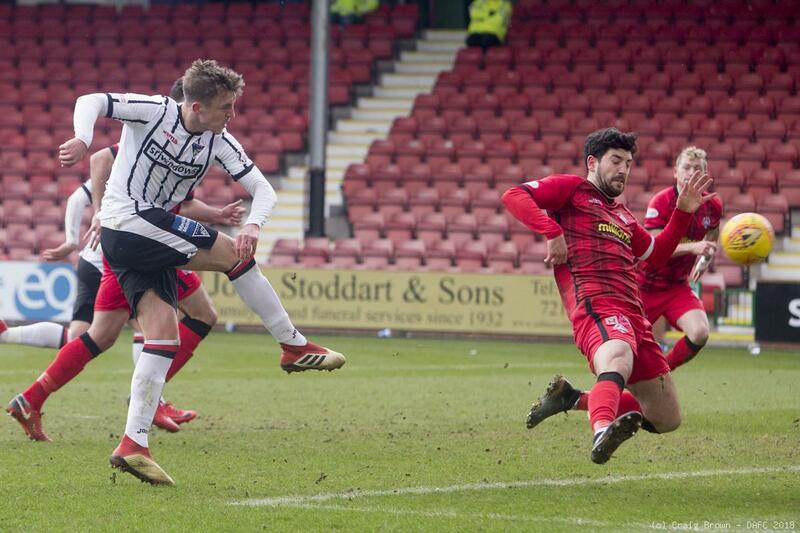 Back in front of the McCathie stand a Beadling shot was turned away for a corner and then a Craigen delivery narrowly escaped away from Clark as he tried to head home. 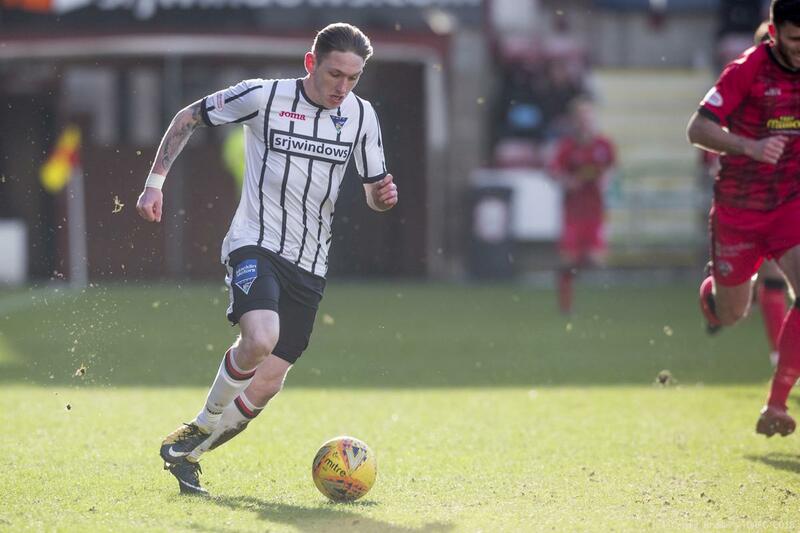 Morton were handed a 24th minute free kick for Morris’ tackle on Oliver and from that Scott Tiffoney was able to deliver a dangerous ball to the far post that Morris turned behind for a corner on the left. 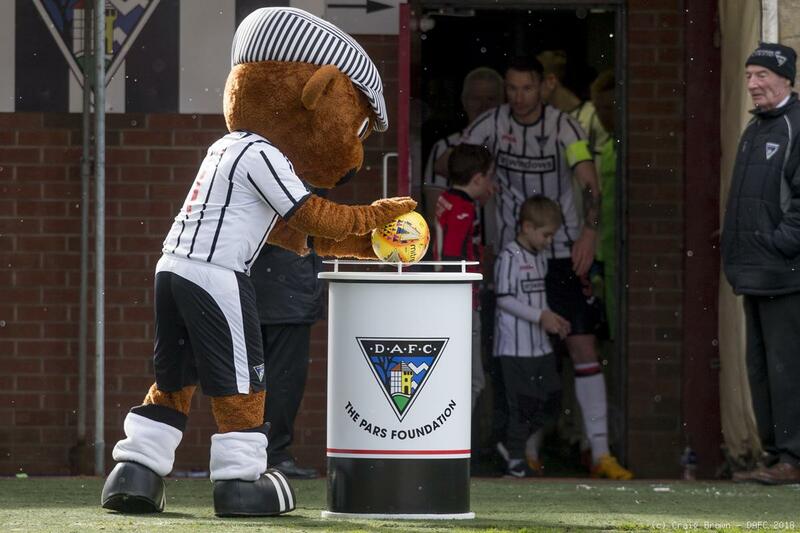 Fortunately that was over hit and Airedale could only help the ball out. 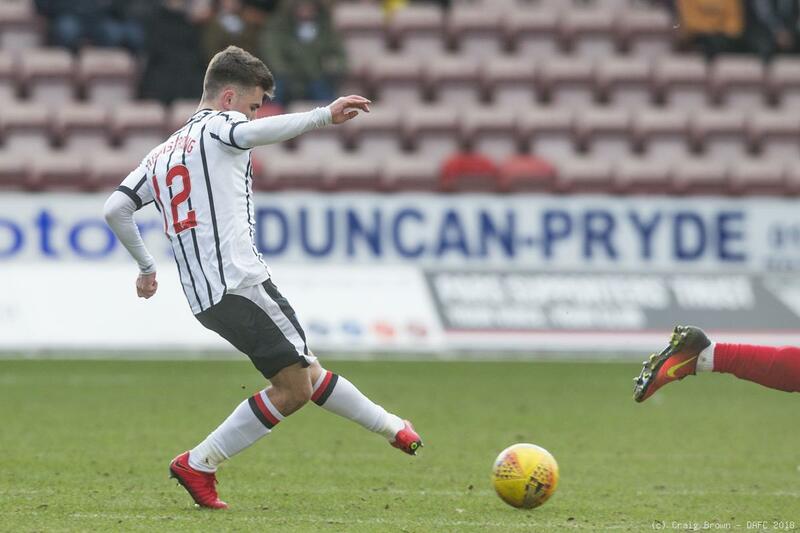 Oliver launched a shot over the bar from 20 yards out before Dunfermline put together a good passing move right from Morris’ defending a Ross break. 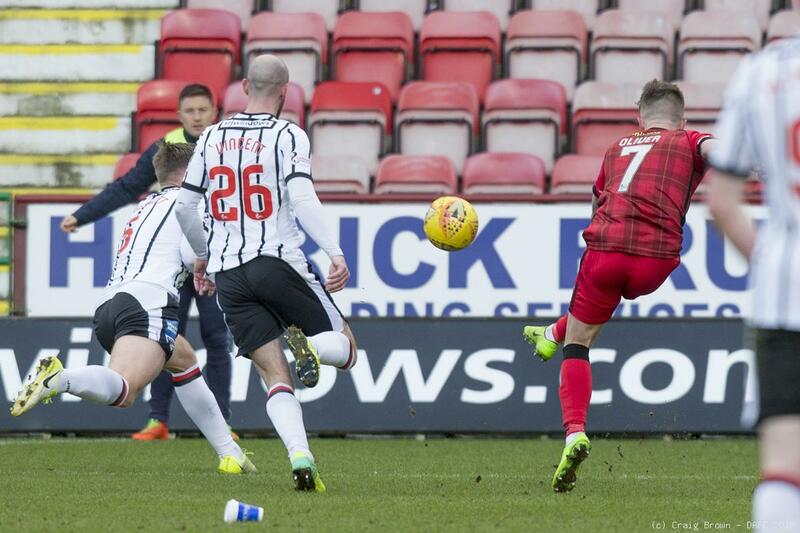 The ball was played forward through Vincent, Craigen, McManus, Clark and Martin before Craigen sent over a dangerous ball from the left that Morton snuffed out. 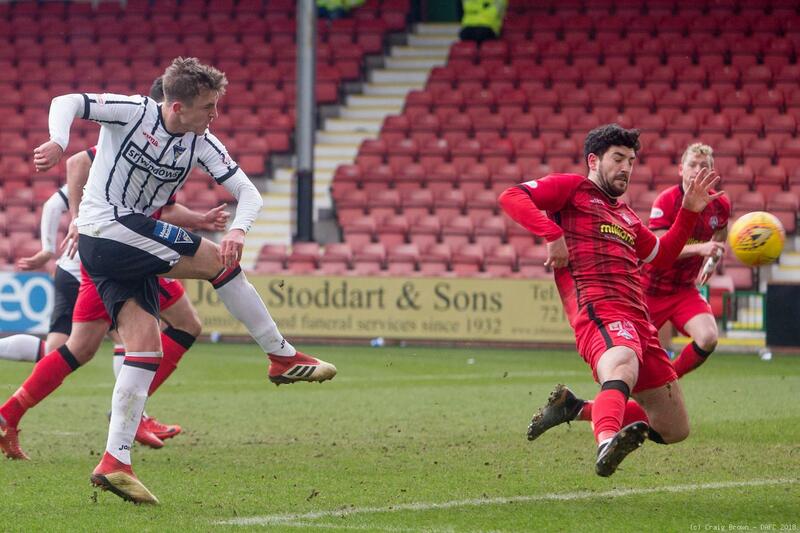 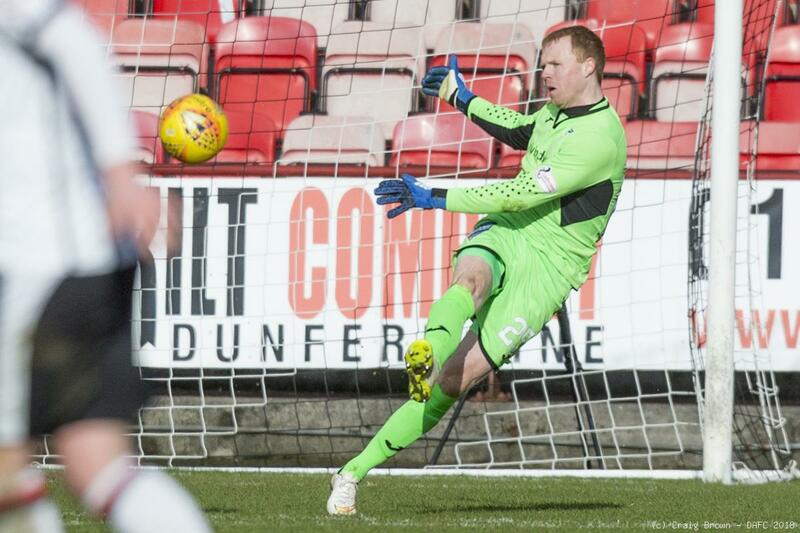 The Pars finished the half slightly stronger but neither side were able to work either keeper. 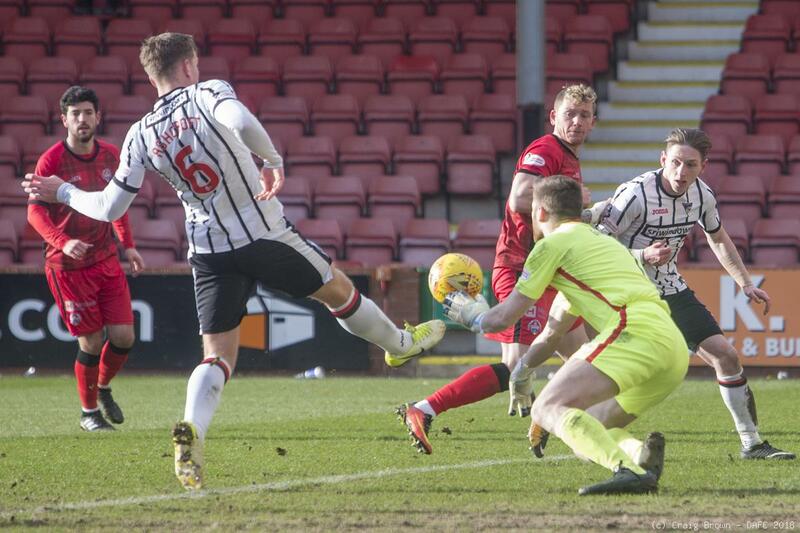 Beadling stuck out his leg to divert a Higginbotham pass but Gaston held and the better chance fell to McManus who drilled his shot into the left sidenetting. 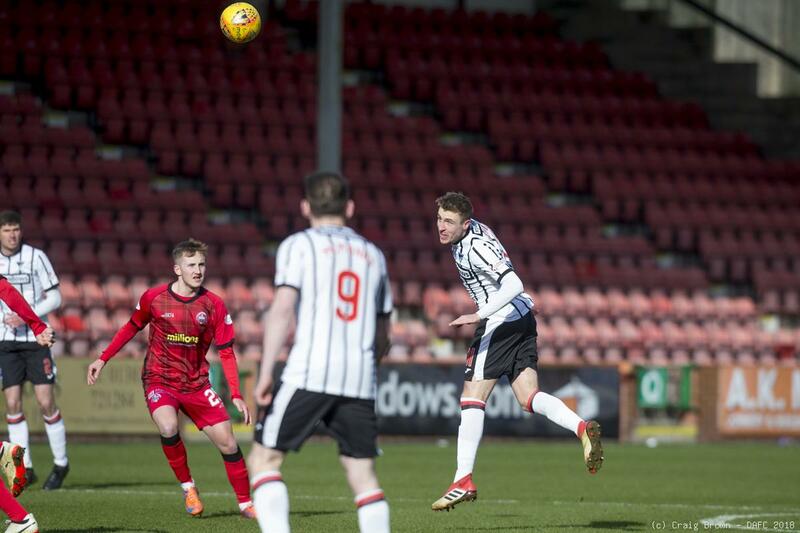 First shot of the second half was from McManus as he was fed the ball by Beadling but again the Pars striker was wide left. 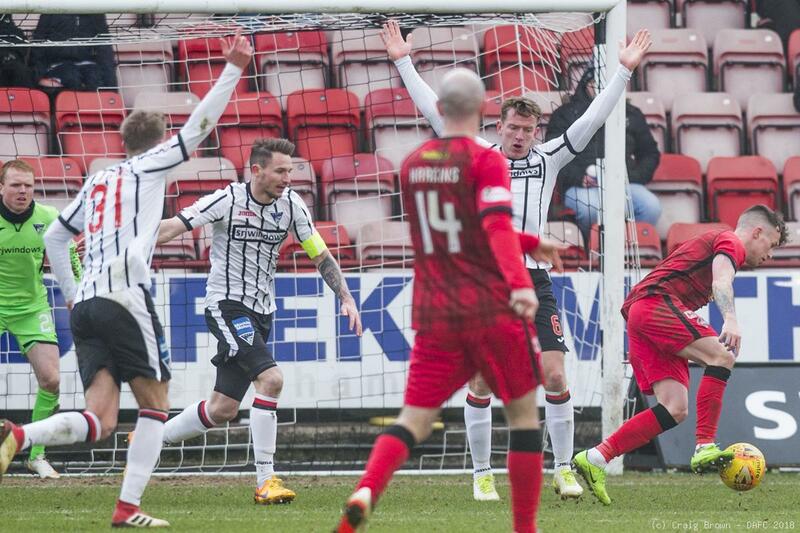 There was little more to note until the Fifers forced a corner on the right in 56 minutes. 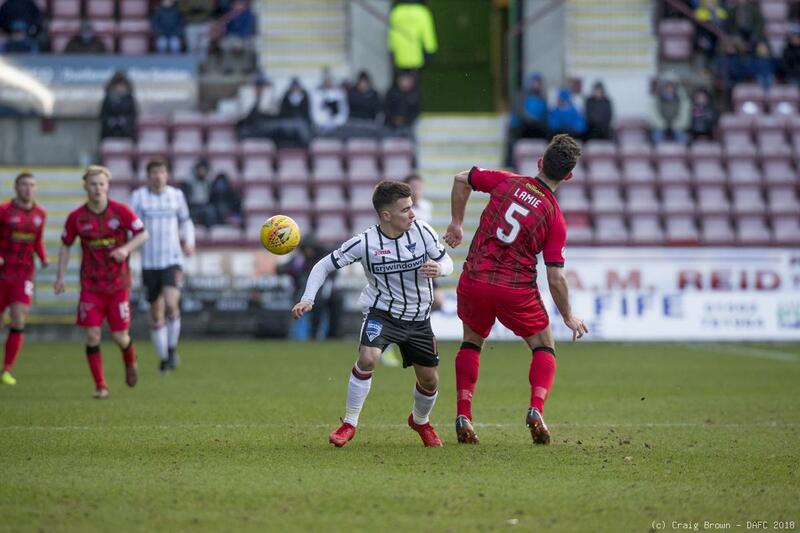 Craigen’s ball in was low to the near post but Tidser’s touch skied the ball into the six yard box and amidst cries of hand ball from the stand Morton cleared. 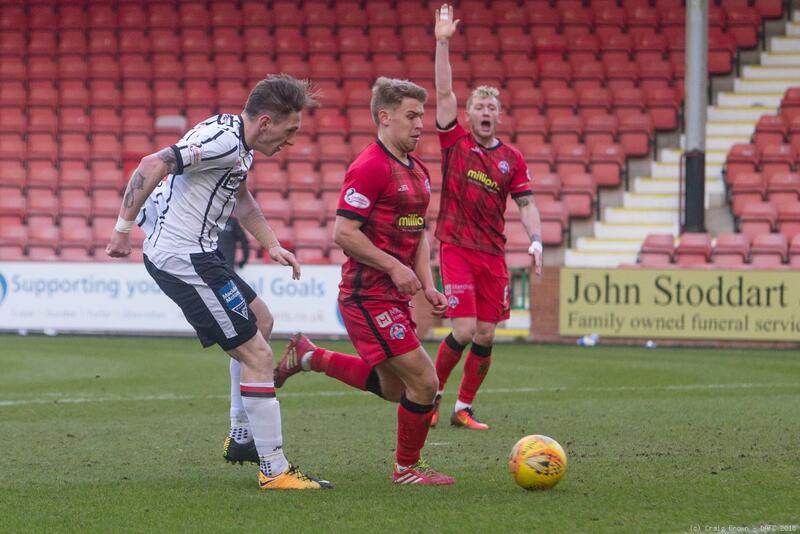 Three minutes later McManus wrongfooted his marker with a switch inside to Clark who then sent his fellow striker speeding down the right. 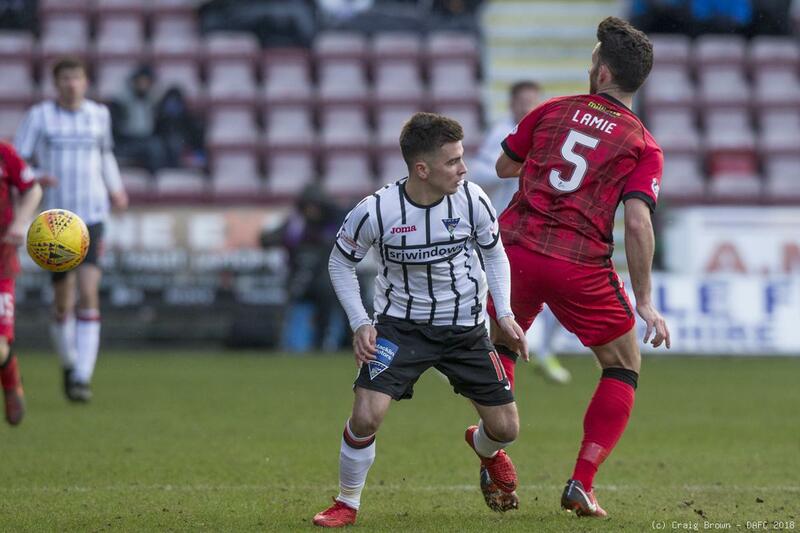 McManus might have shot but squared, Clark could not connect but Craigen gathered in space on the left side of the ‘Ton box but Ricki Lamie intercepted and the promising opportunity had gone. 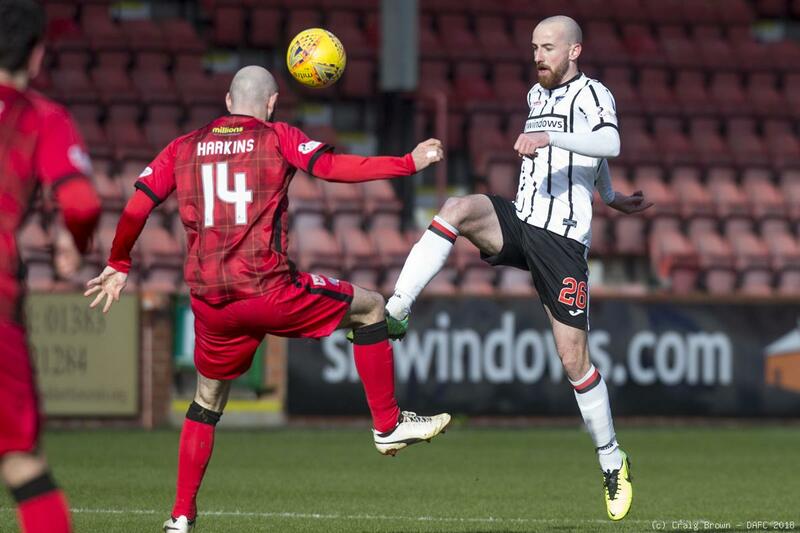 Higginbotham launched a 62nd minute free kick from the centre circle towards Morris on the left side of the box but Ashcroft just couldn’t get to the knock down. 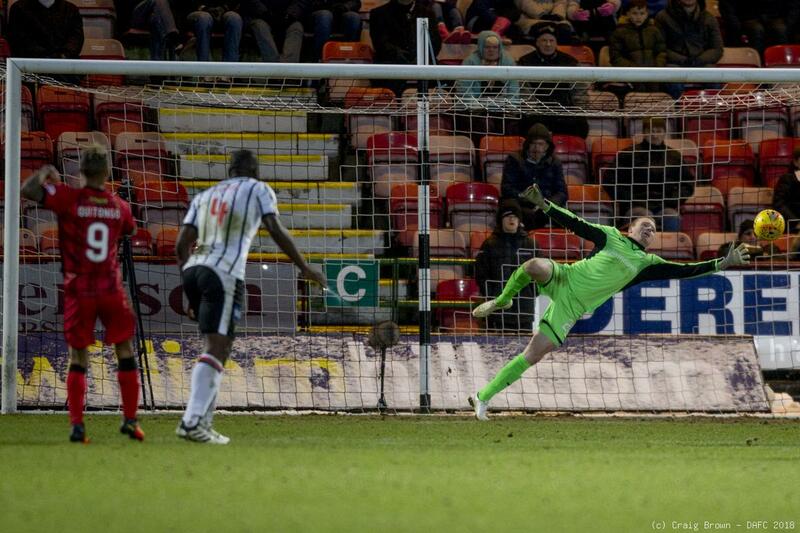 At the other end Oliver was penalised for hand ball in front of goal from a Tiffoney cross. 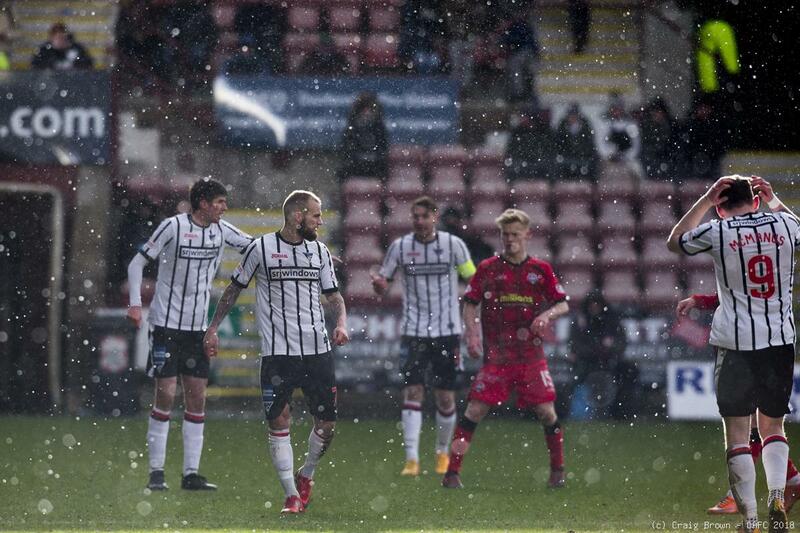 In sunshine and snow Williamson prevented Ross crossing and Robinson then swiftly sent Martin away up the left. 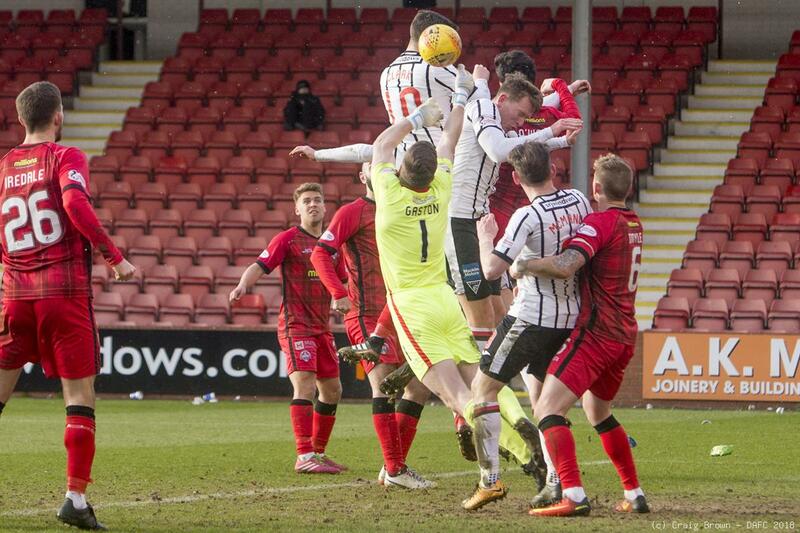 McManus took over to feed Clark, back to goal on the edge of the box. 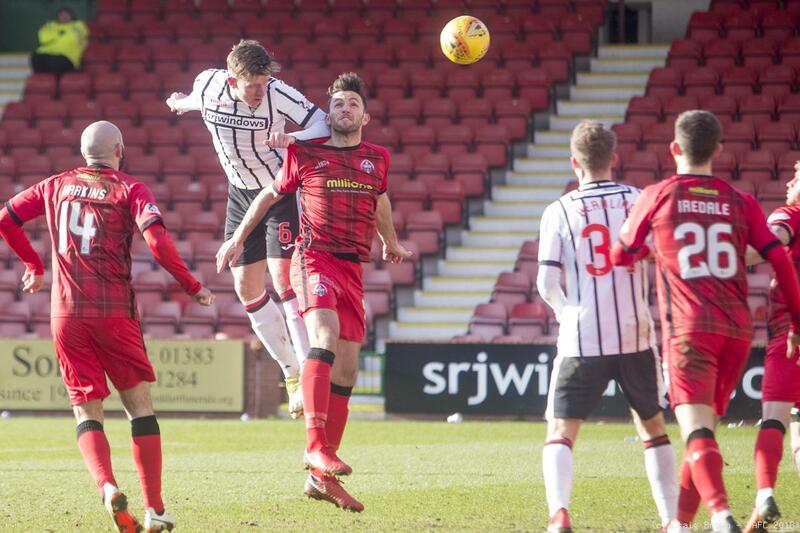 Higginbotham then took the ball to the right and cut back but Beadling’s header went wide right. 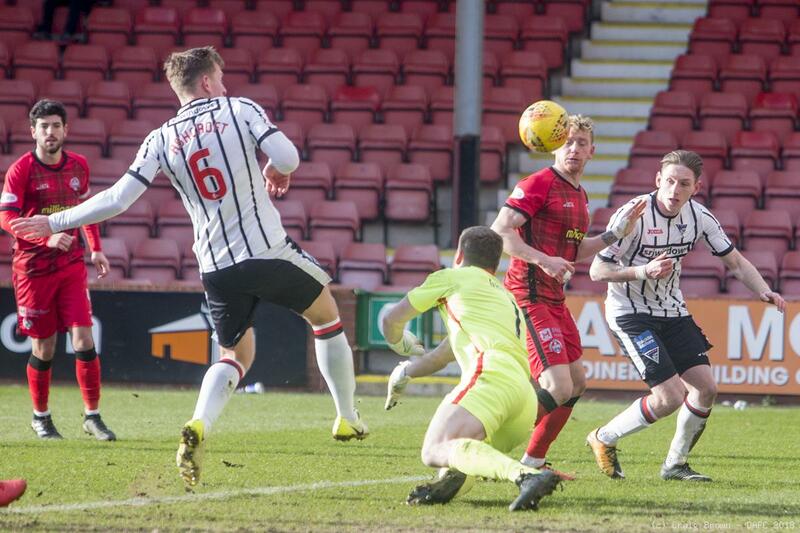 Midway through the half a good McManus strike was deflected behind off Doyle and from Craigen’s corner Gaston came and failed to take. 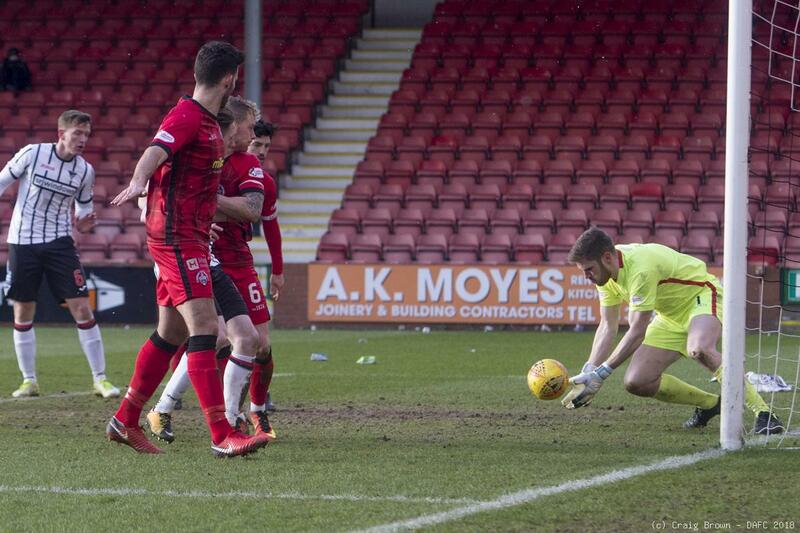 The ball went across the box and a Morris returned what turned out to be a shot that Gaston had to drop to his knees to stop on his goal line. 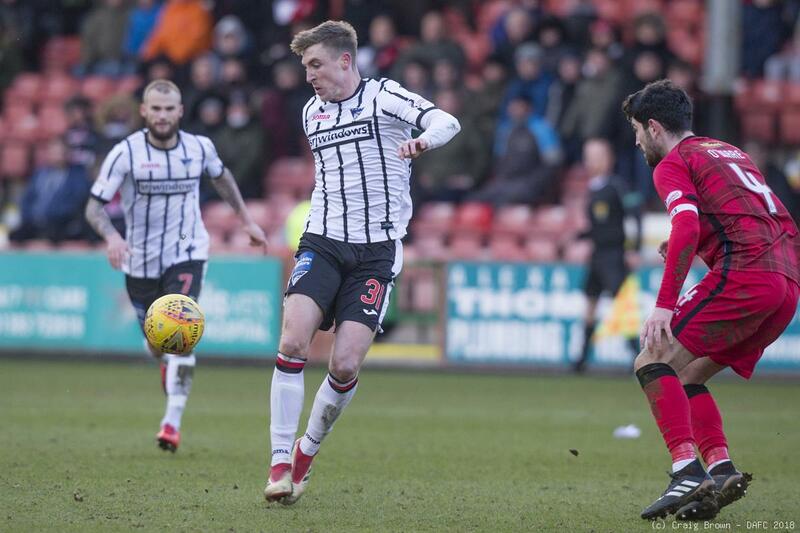 Another Pars chance quickly followed when Williamson’s cross found Clark in front of goal but he just couldn’t get the vital shot in. 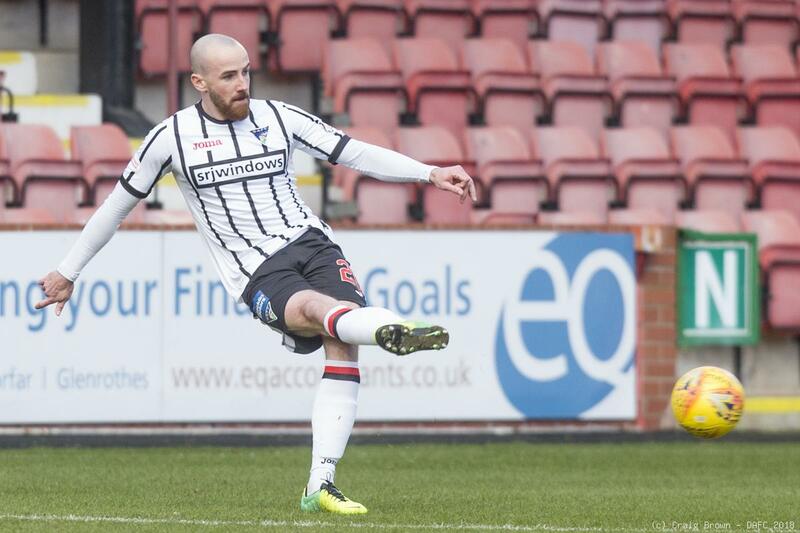 Then in 72 minutes Williamson and Beadling worked the ball up the right channel. 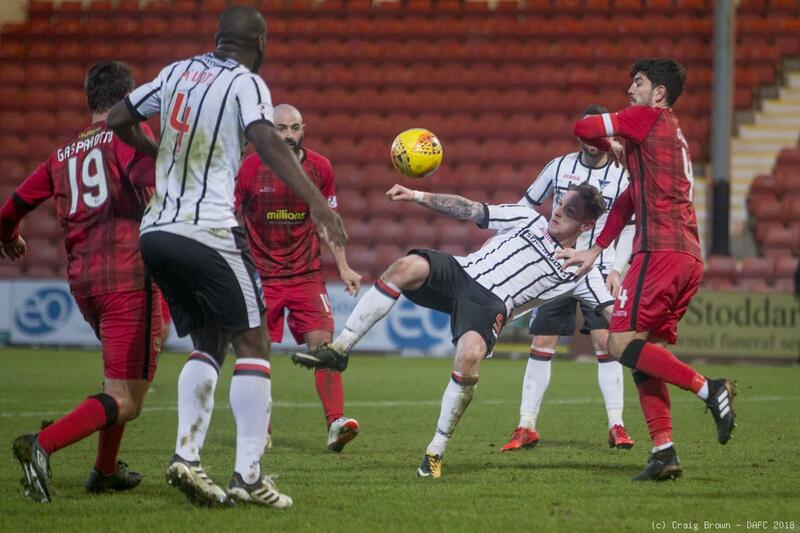 The defence could only get the ball away to Higginbotham who released a stinging shot from 25 yards out. 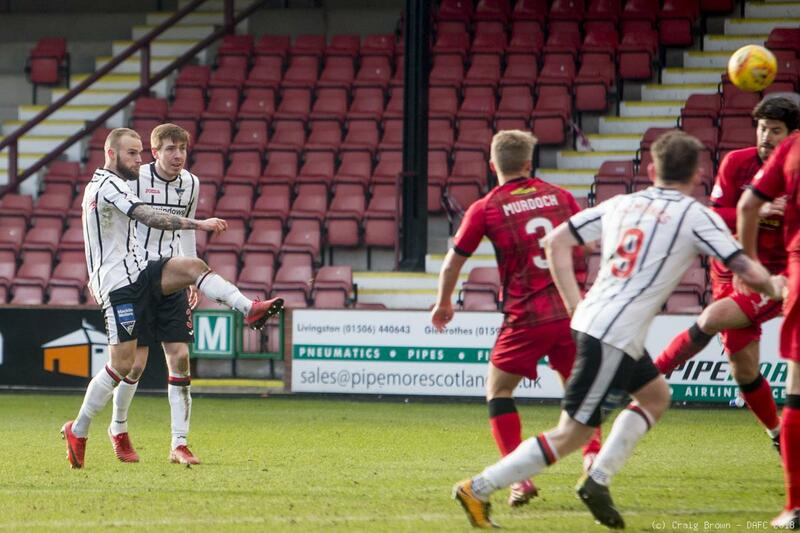 Gaston reached out to his left to stop the shot and McManus failed to turn in what was a good chance for an opener. 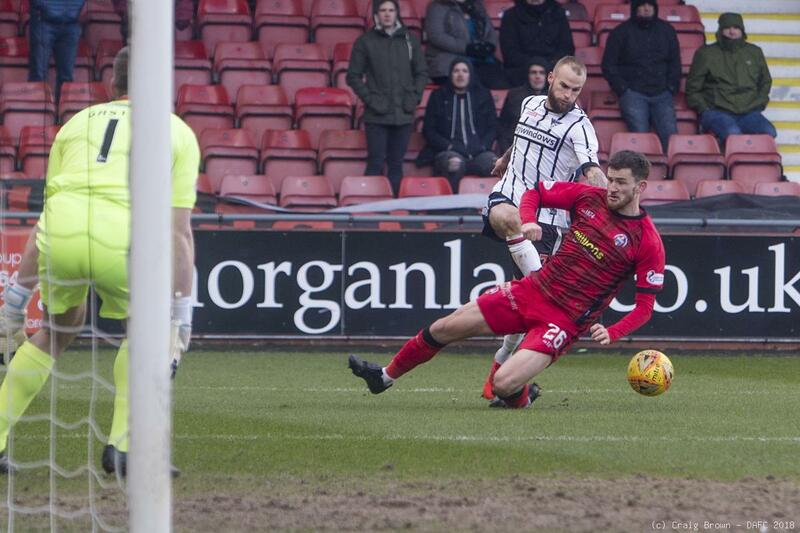 Ashcroft swung the ball wide right to Higginbotham in 75 minutes and he slipped the ball into the path of Beadling. 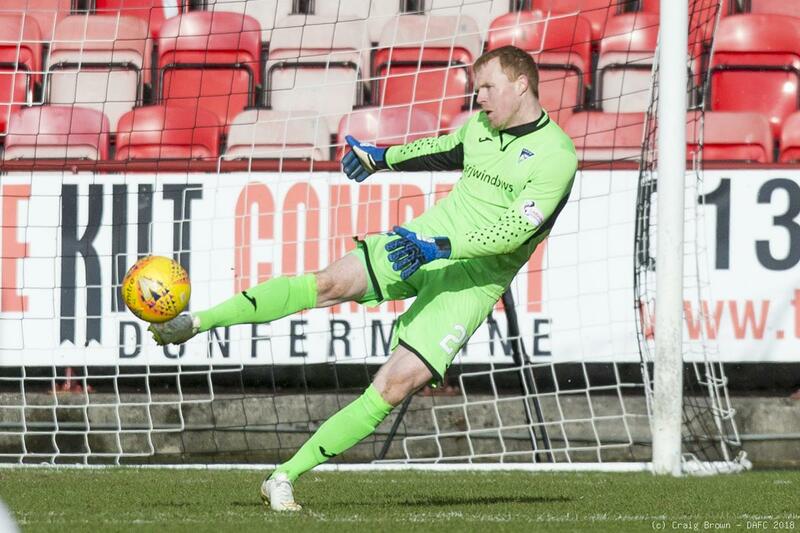 The big Englishman had time to check where the goals were before clipping his shot towards it but the ball broke back off the crossbar. 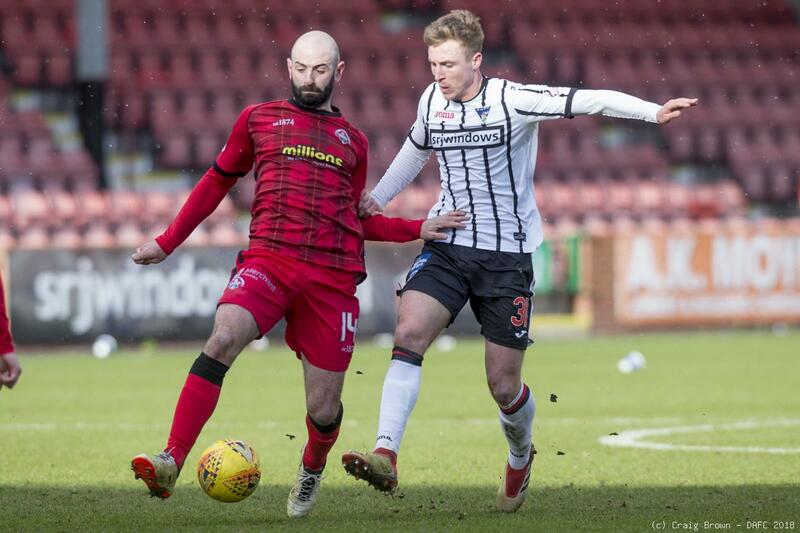 Allan Johnston then made a double substitution withdrawing James Craigen and Nicky Clark to replace them with Dan Armstrong and Fraser Aird. 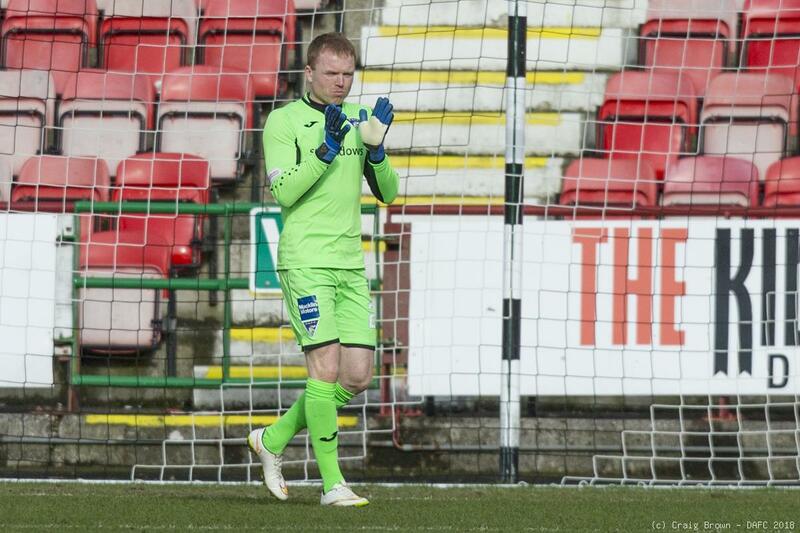 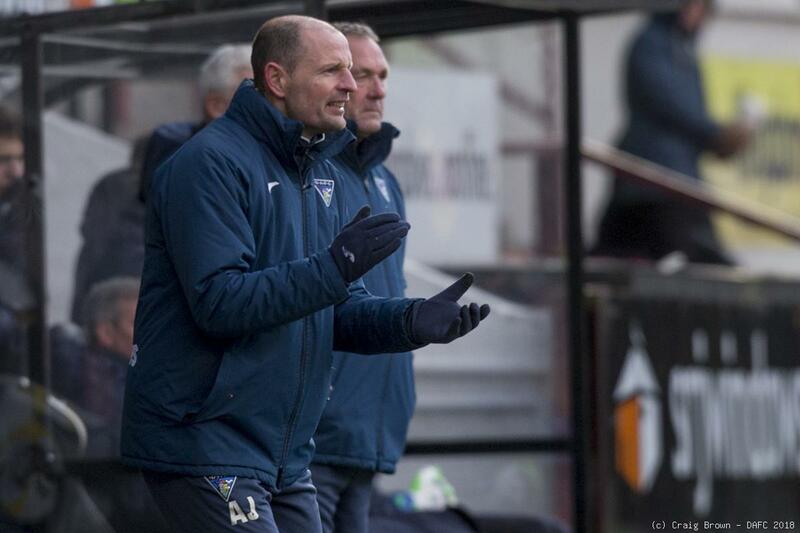 It was Armstrong who forced an 81st minute corner on the left. 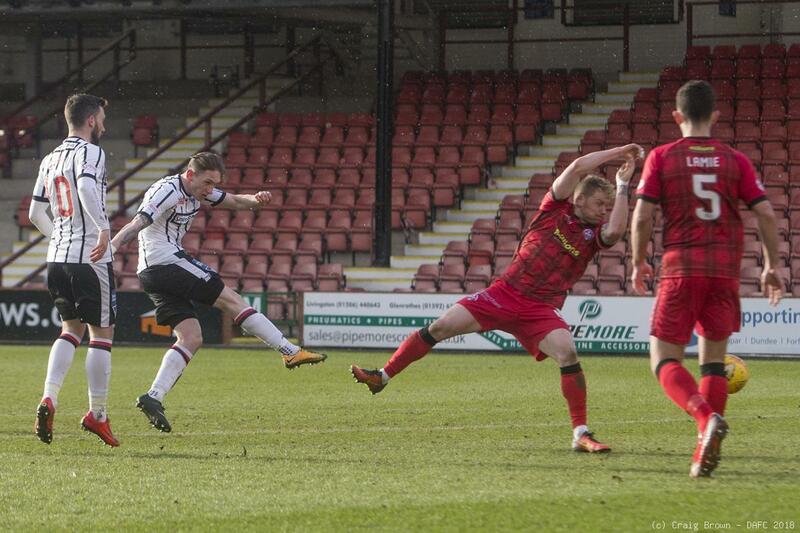 Gaston punched away Higginbotham’s cross but Armstrong gathered and crashed a powerful shot on to the left upright. 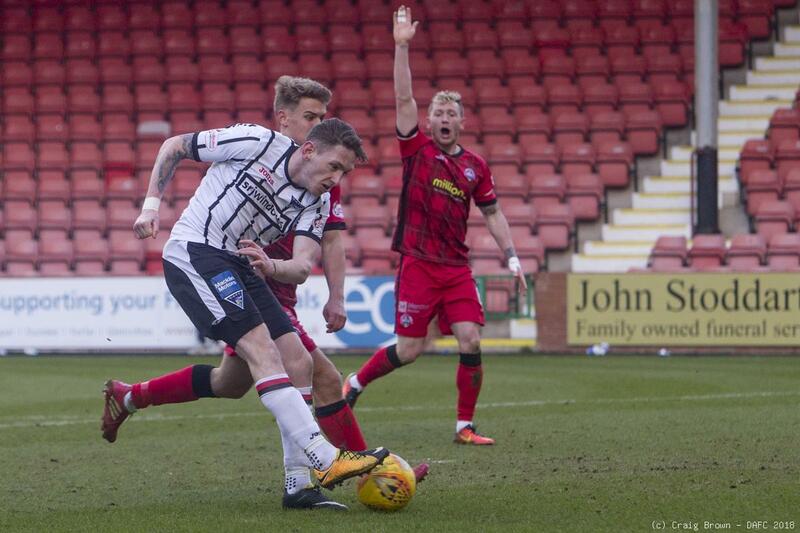 McManus followed up but his shot found the arms of Gaston. 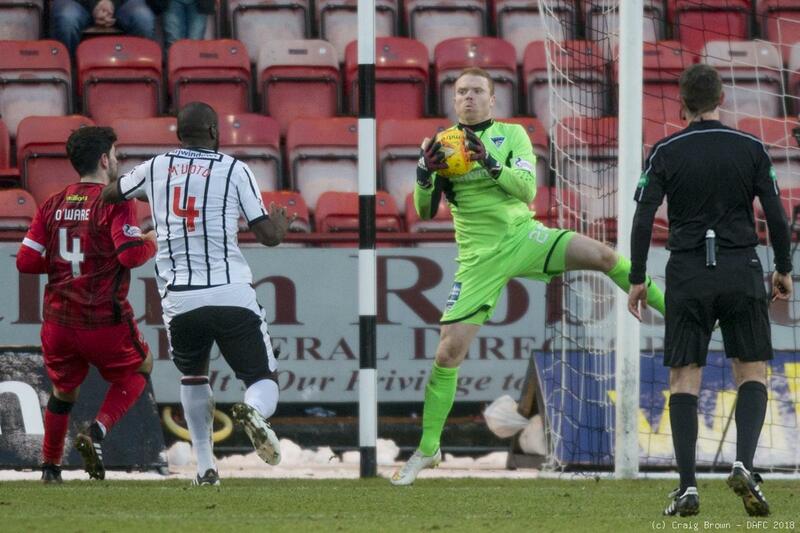 That was really the last opportunity to break the duck but it was to end without the ball hitting the net. 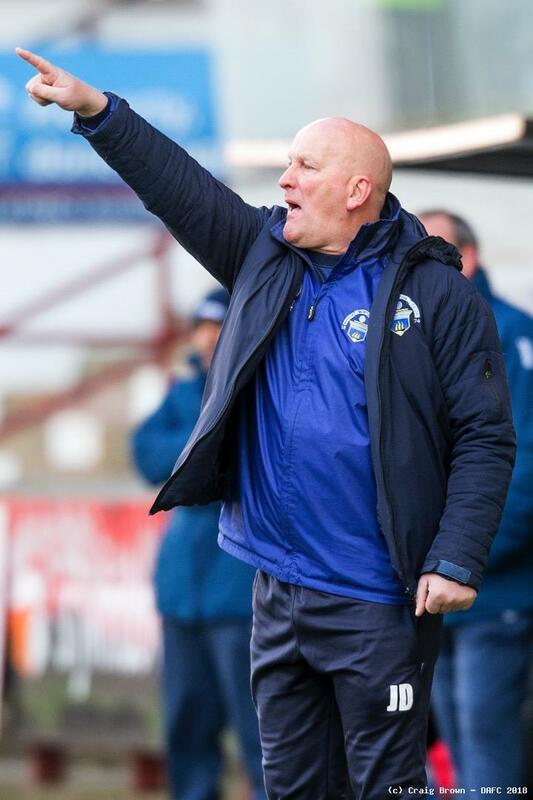 One point apiece probably suited Morton more than Dunfermline and the Greenock side moved to 43 points from 29 matches. 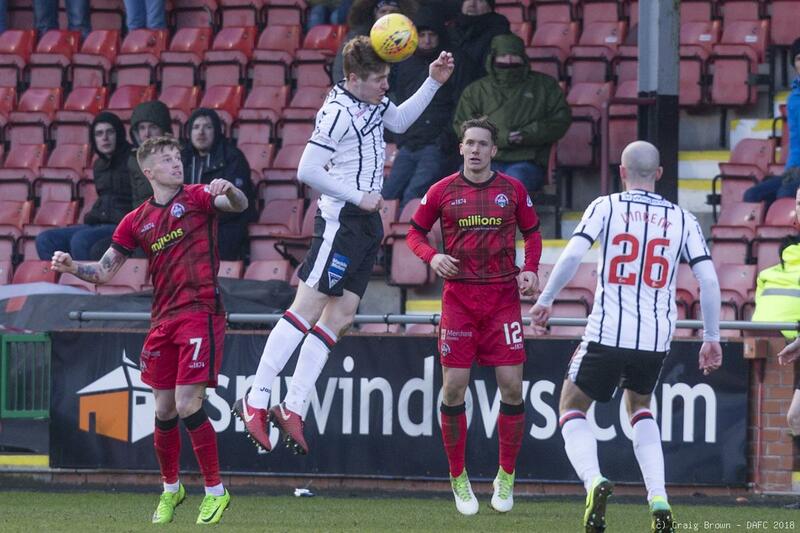 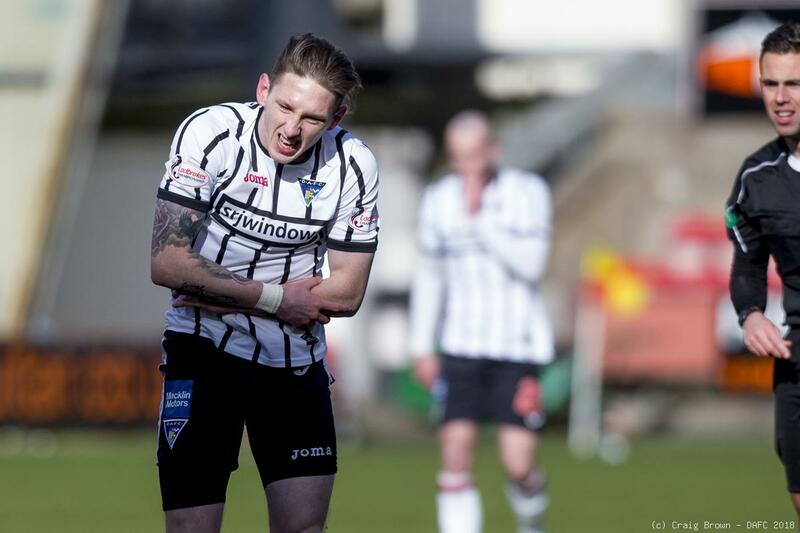 Dunfermline sat on 39 from one match less. 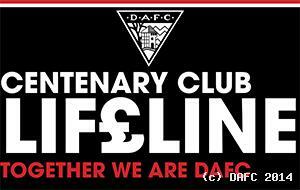 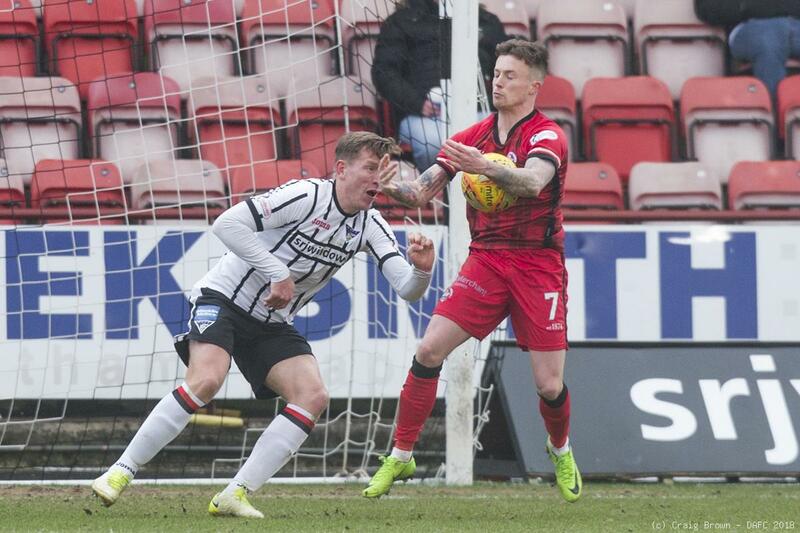 DUNFERMLINE: Lee Robinson: Ryan Williamson, Callum Morris (c) Lee Ashcroft, Lewis Martin: James Craigen (Fraser Aird 76), Tom Beadling, James Vincent, Kallum Higginbotham, Declan McManus, Nicky Clark (Dan Armstrong 76). 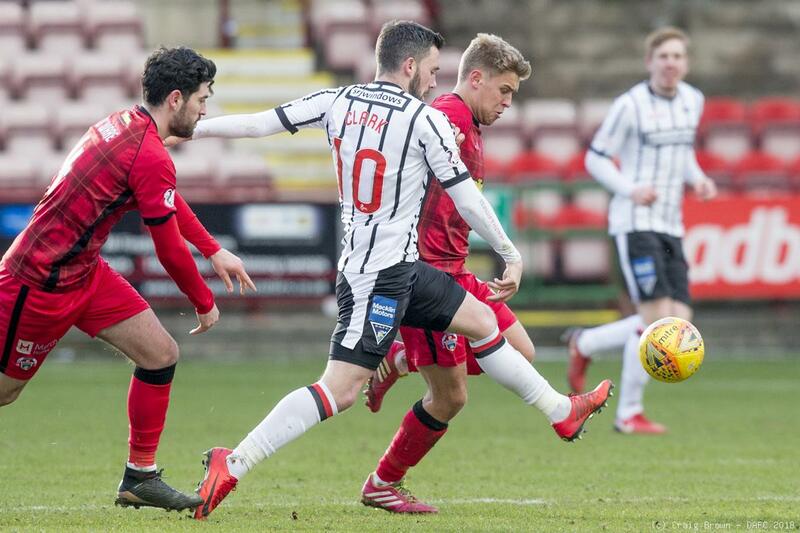 NEXT MATCH: Ladbroke Championship: (away) v Brechin City, Tuesday 20th March 2018, 7.45pm kick off at Glebe Park. 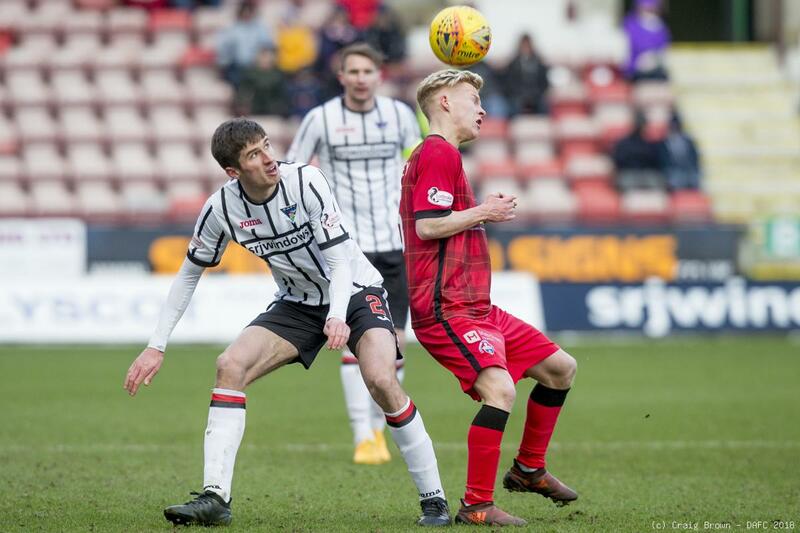 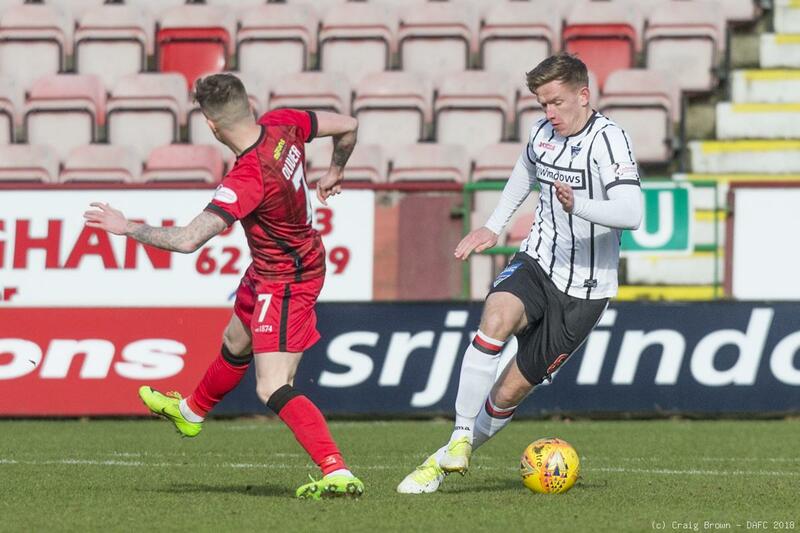 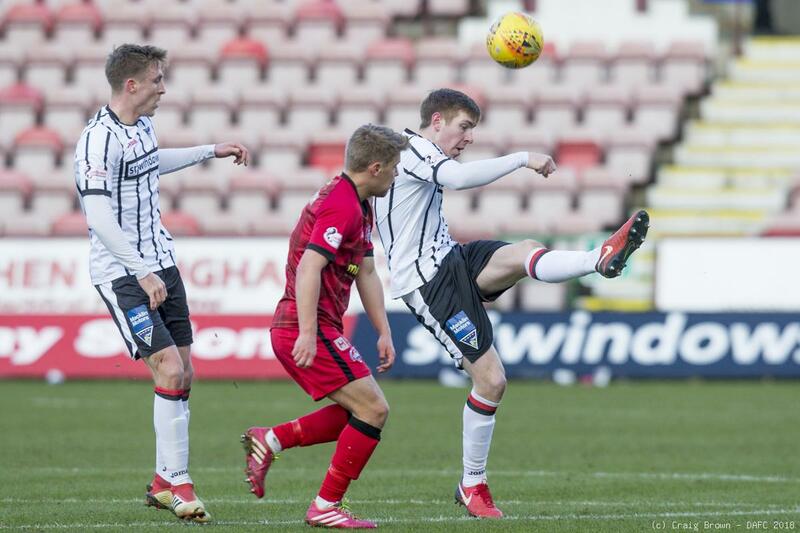 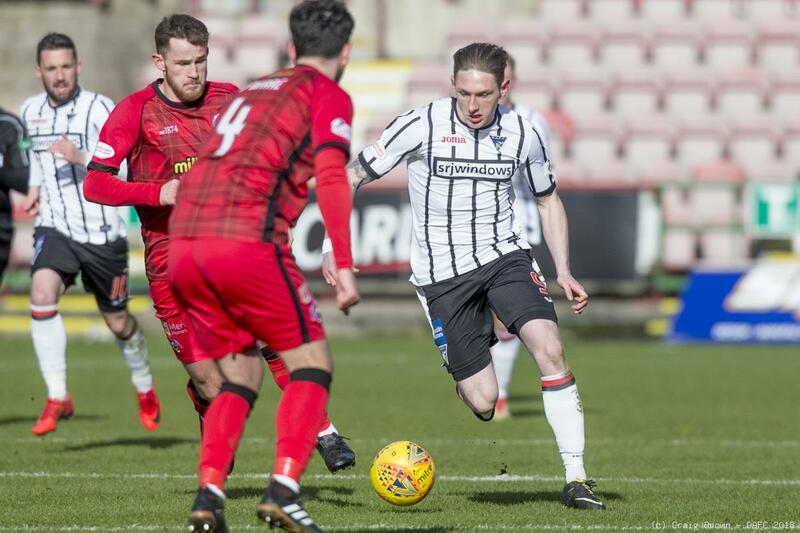 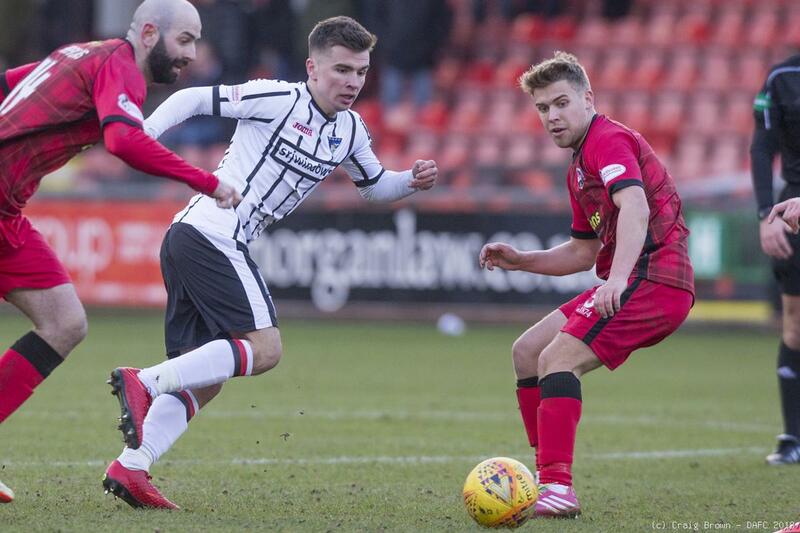 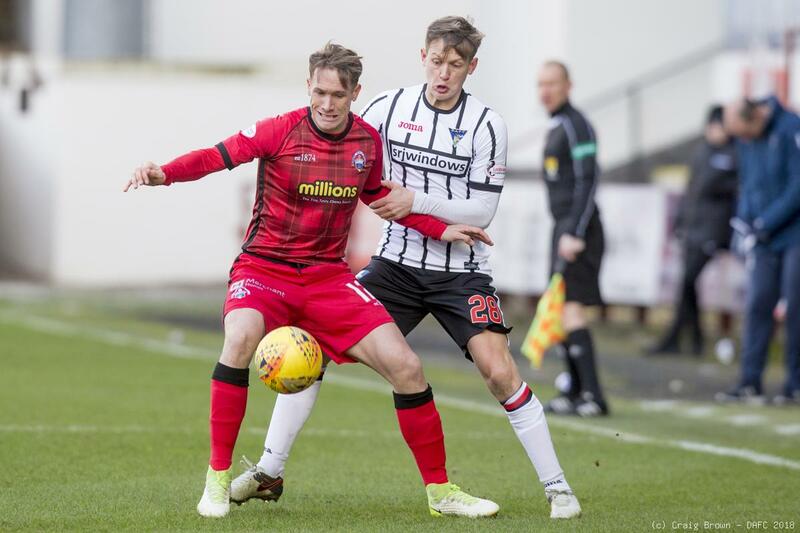 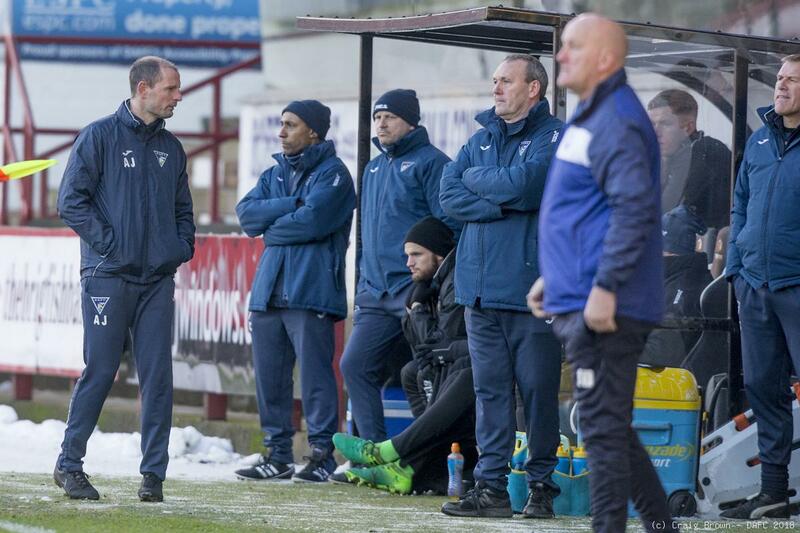 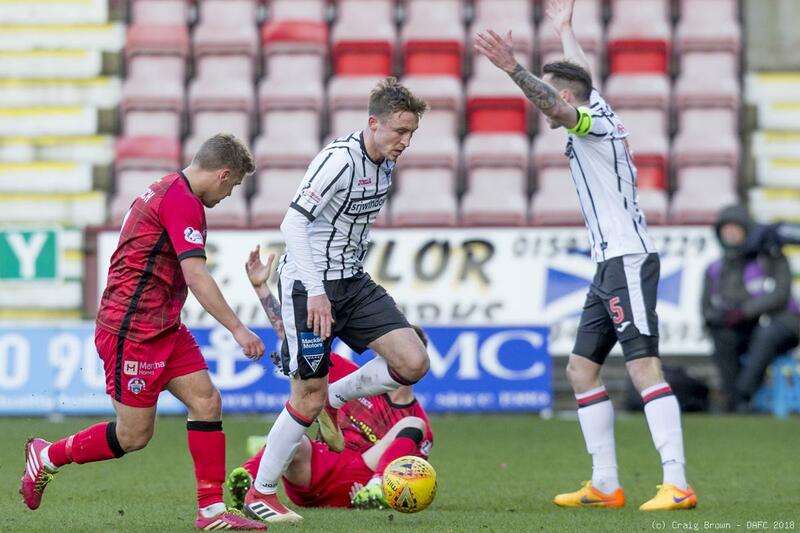 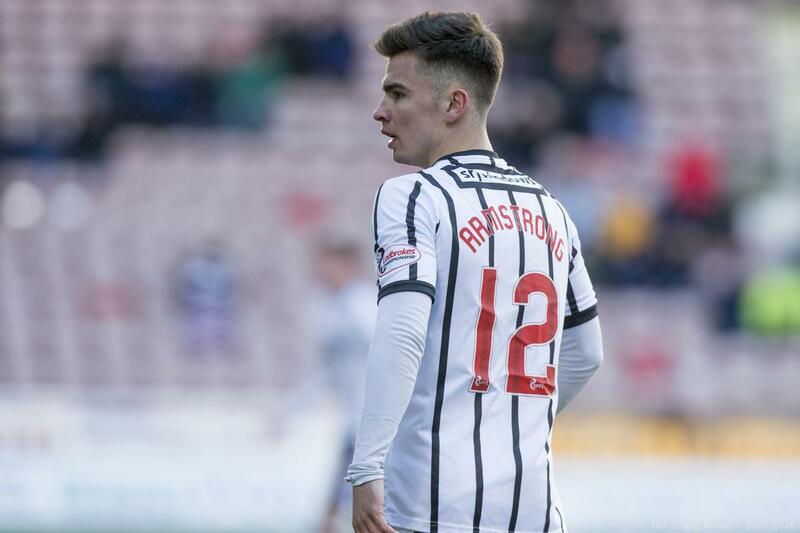 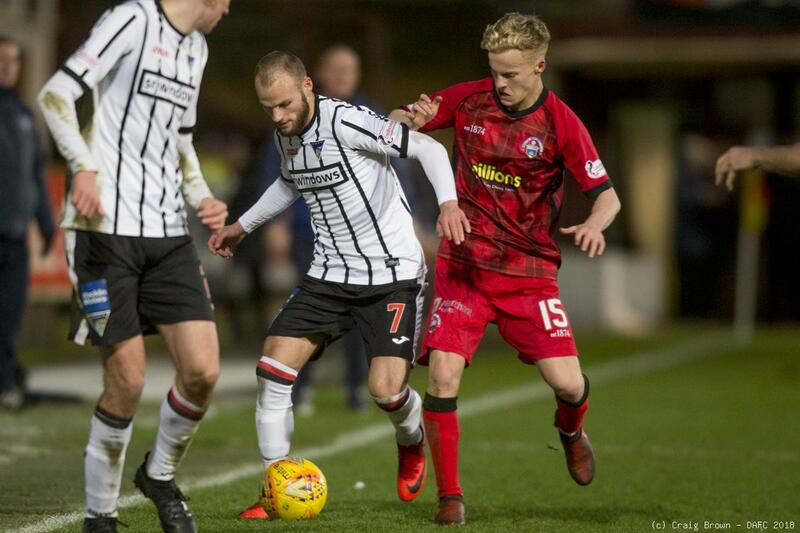 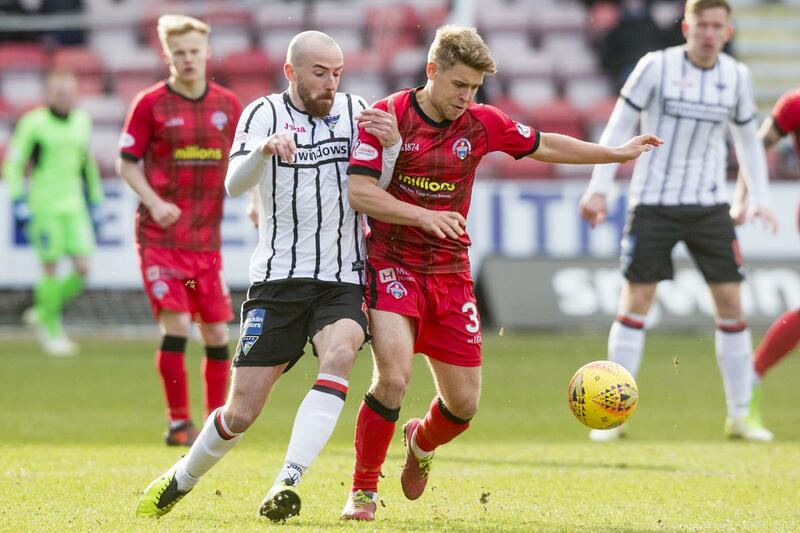 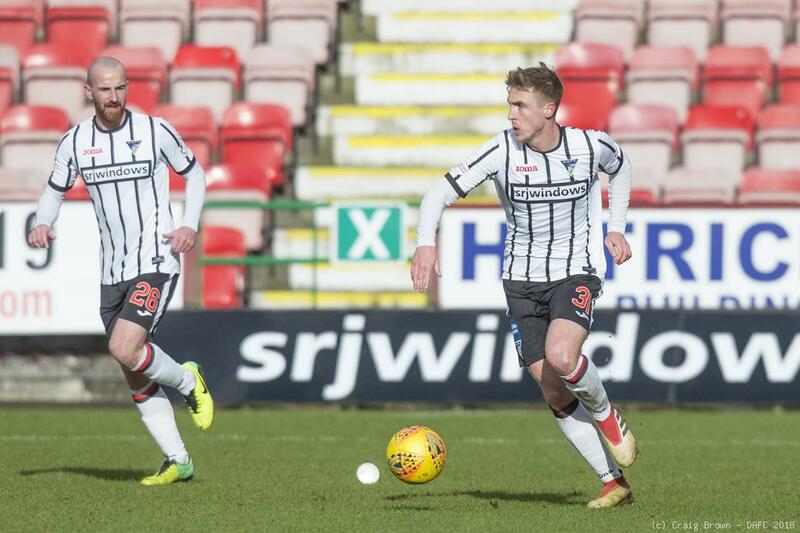 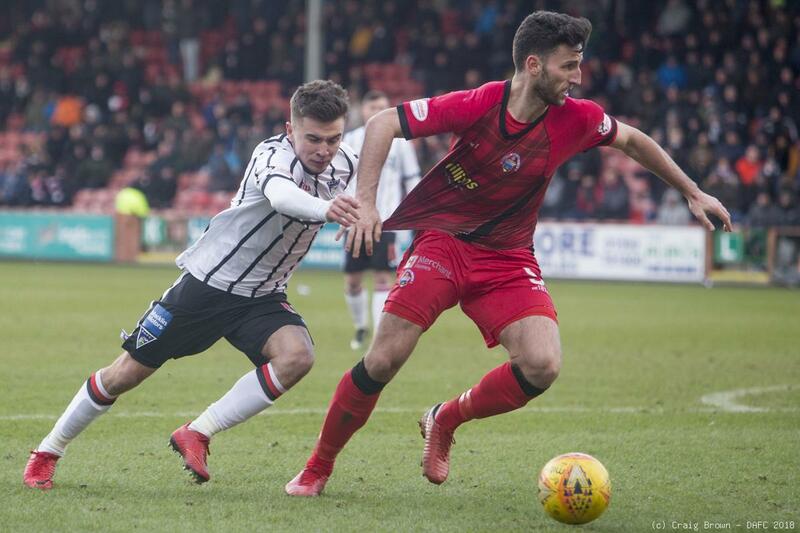 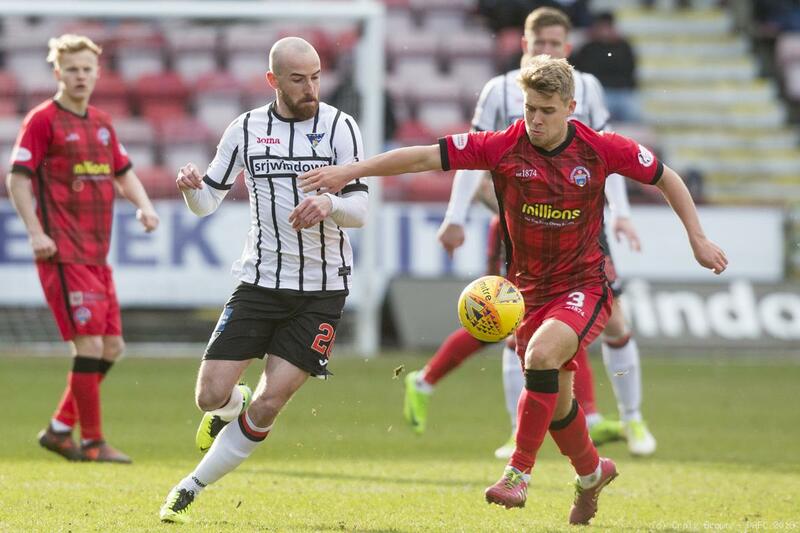 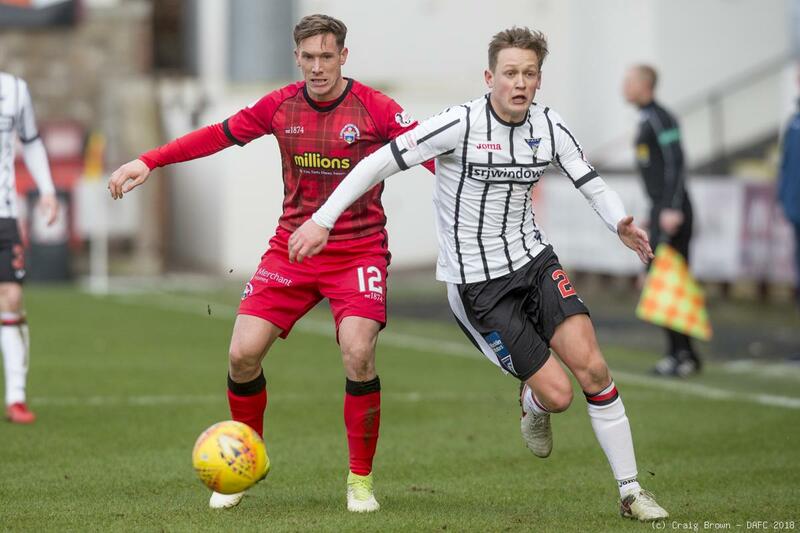 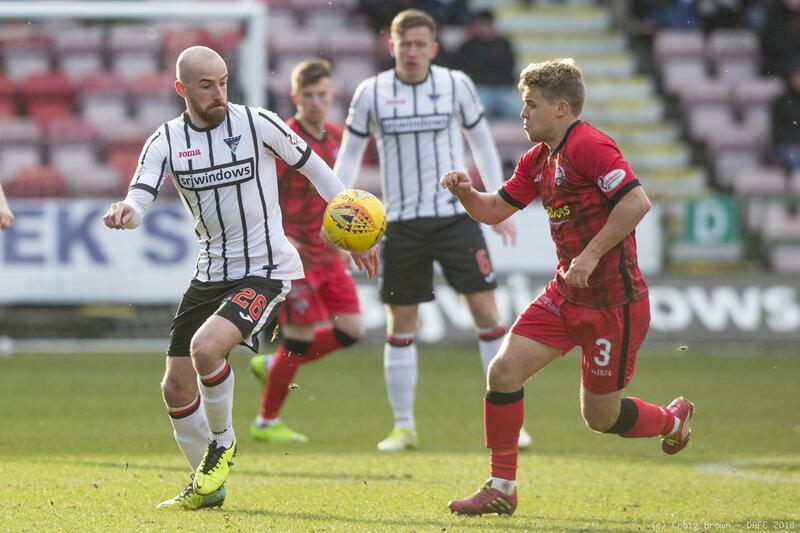 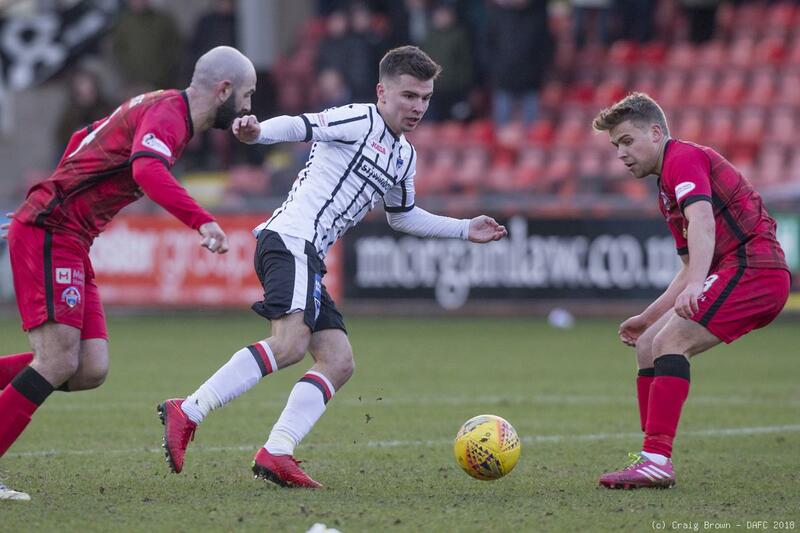 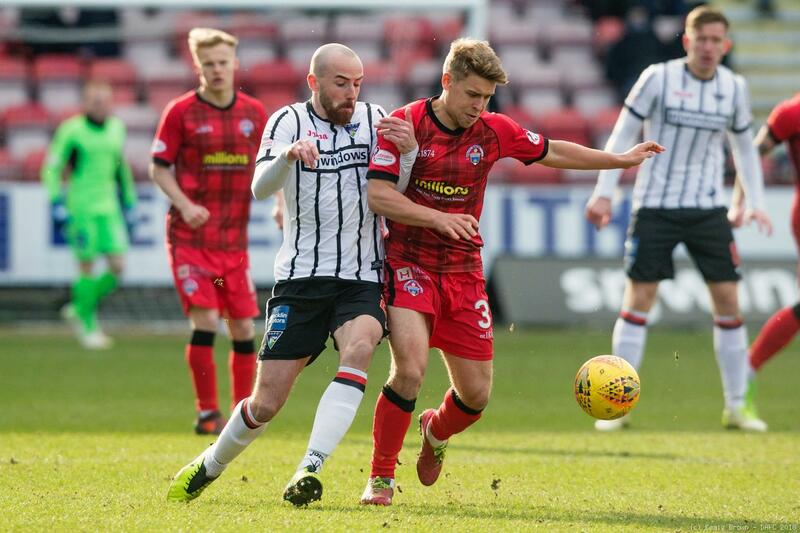 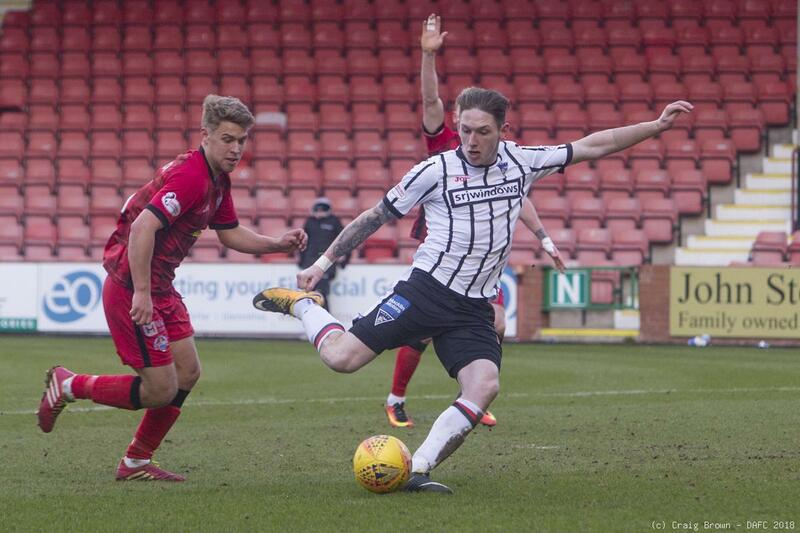 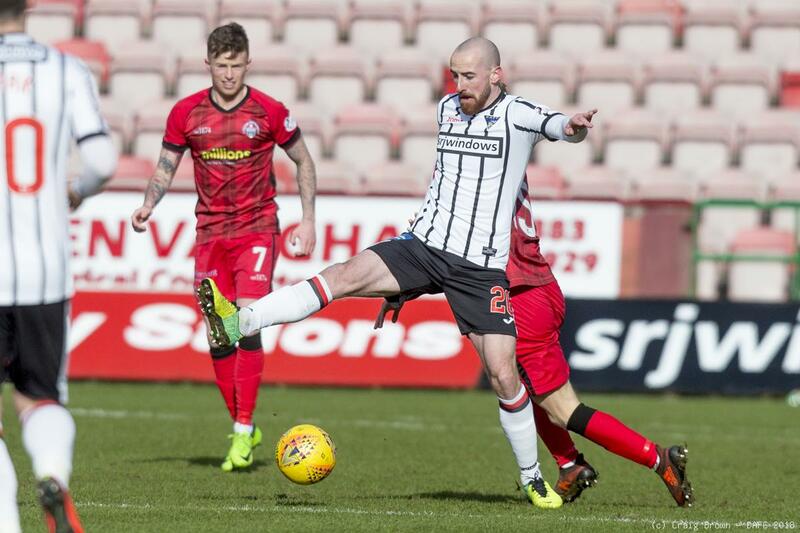 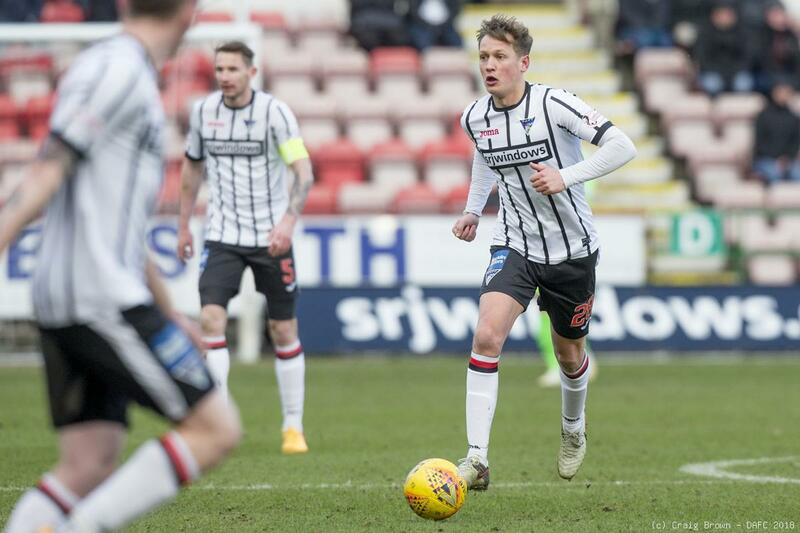 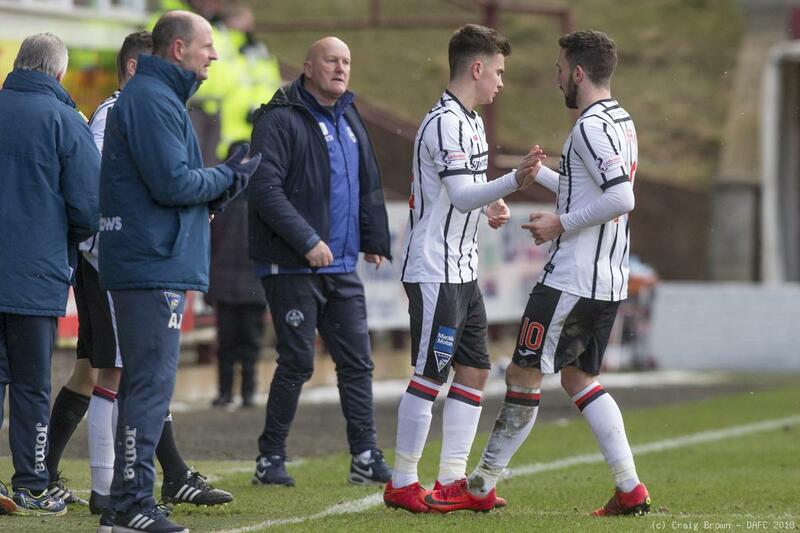 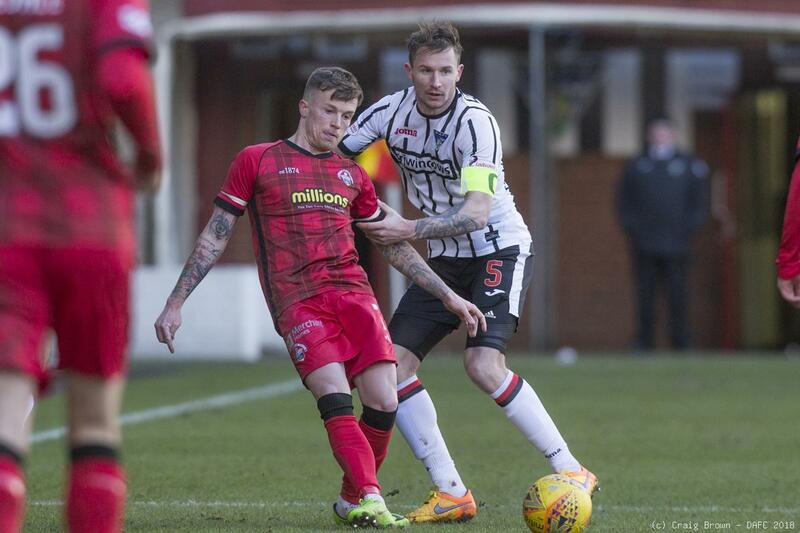 Following on from the win over Inverness Caley Thistle on Tuesday night the Pars are keen to take the chance to close the gap on Morton, the team immediately above them. 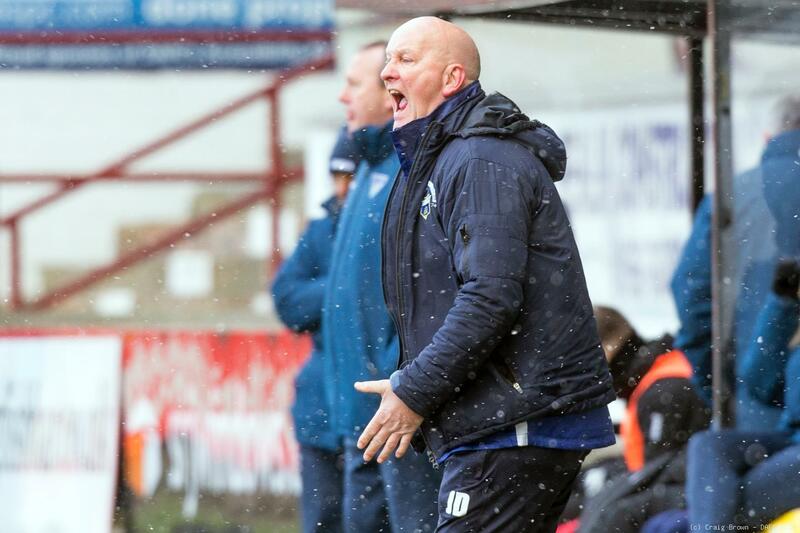 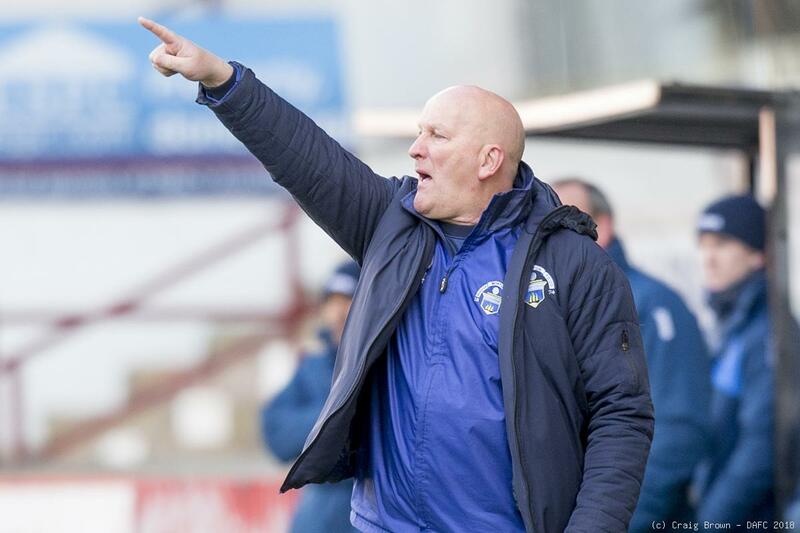 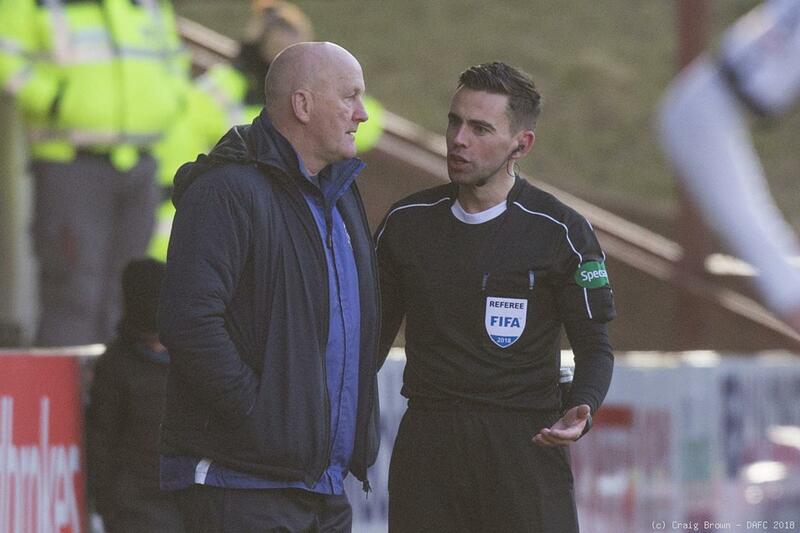 Three points off Jim Duffy’s side would reduced the deficit to one point with a game in hand against Brechin City. 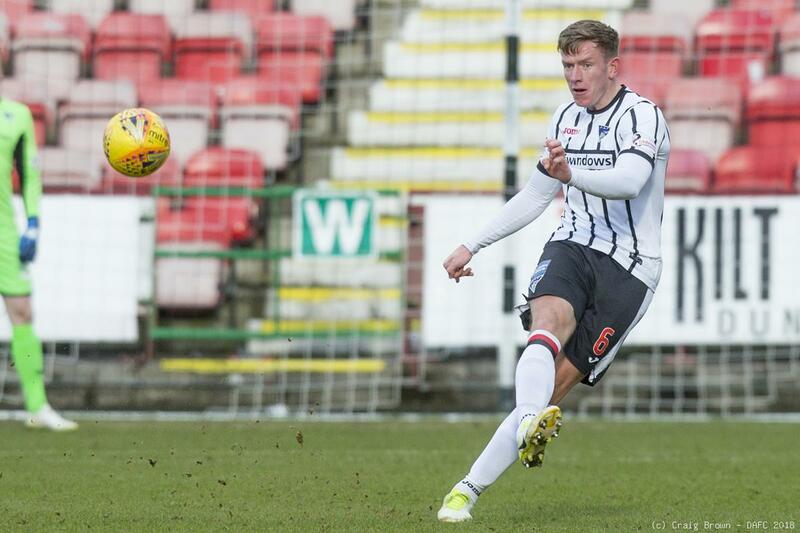 This is the 97th league meeting between these teams and Dunfermline hold the better record 44 wins to Morton’s 30. 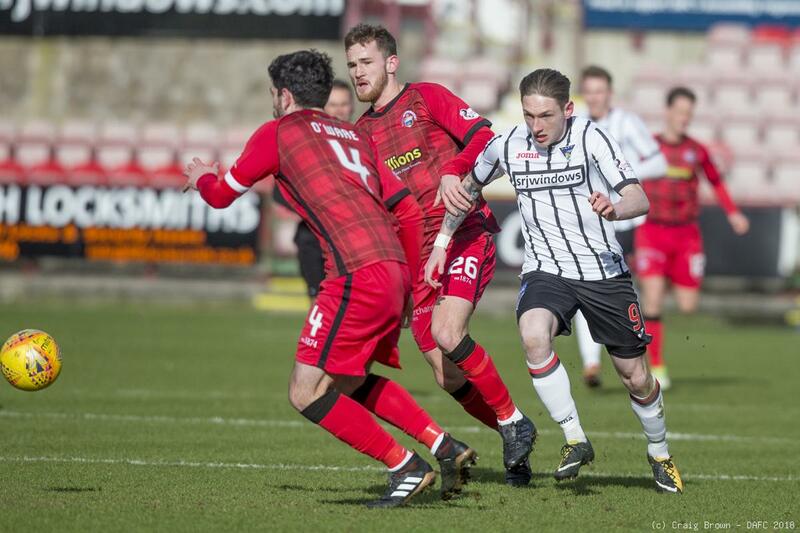 22 have been drawn. 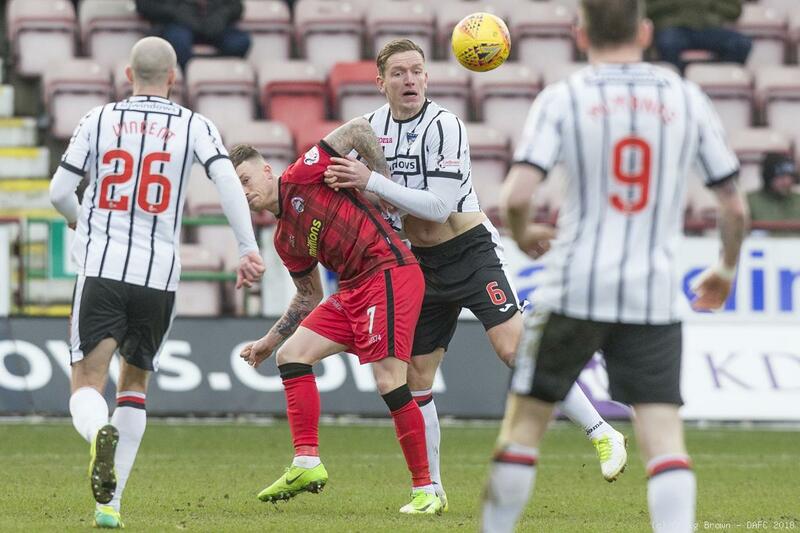 This will be the fifth meeting this season with Morton having three wins all courtesy of winning goals in the closing stages of the matches. 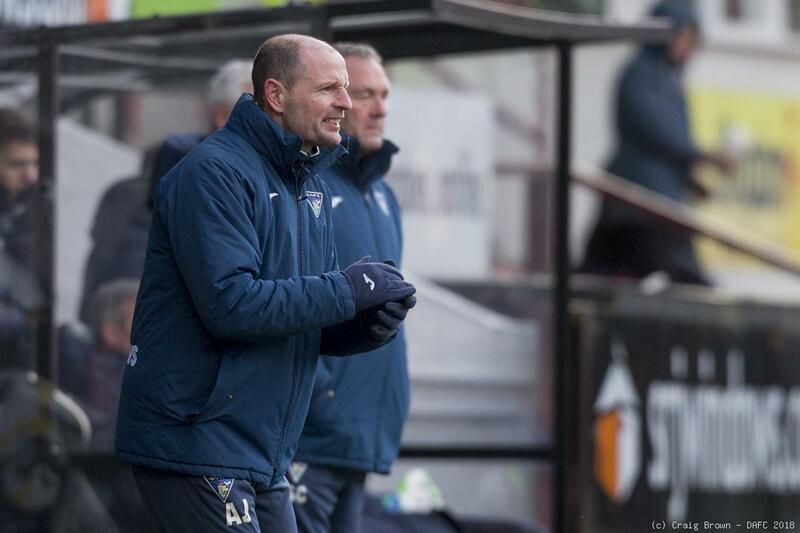 Of the last twelve league meetings Morton have won eight and three have been won by Dunfermline and just one drawn. 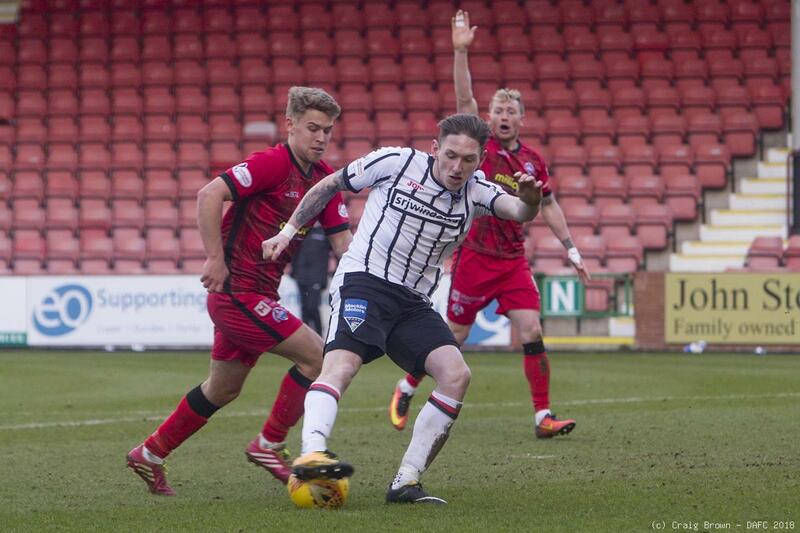 After 24 minutes Gary OLIVER was picked out on the right side of the Pars box and his angled shot beat Lee Robinson. 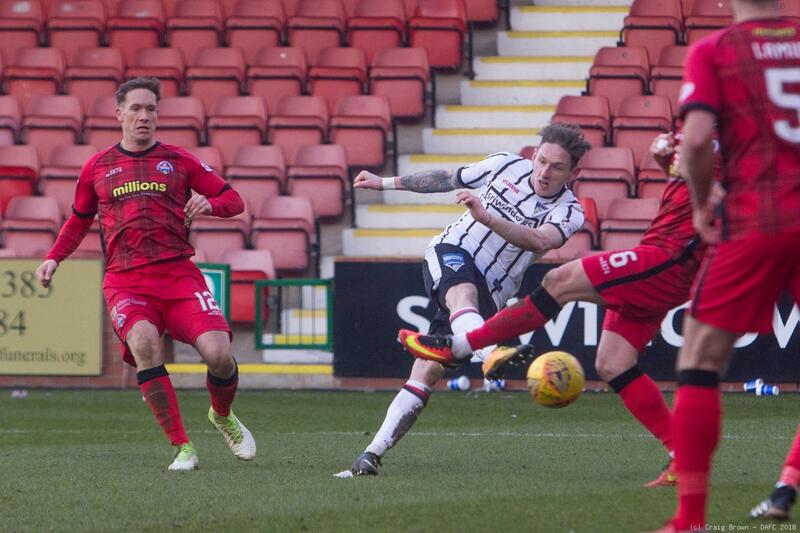 Playing the ball through the middle paid off for an equaliser with Declan McMANUS receiving a pass from Nicky Clark to make the break and ram the ball home from the edge of the box. 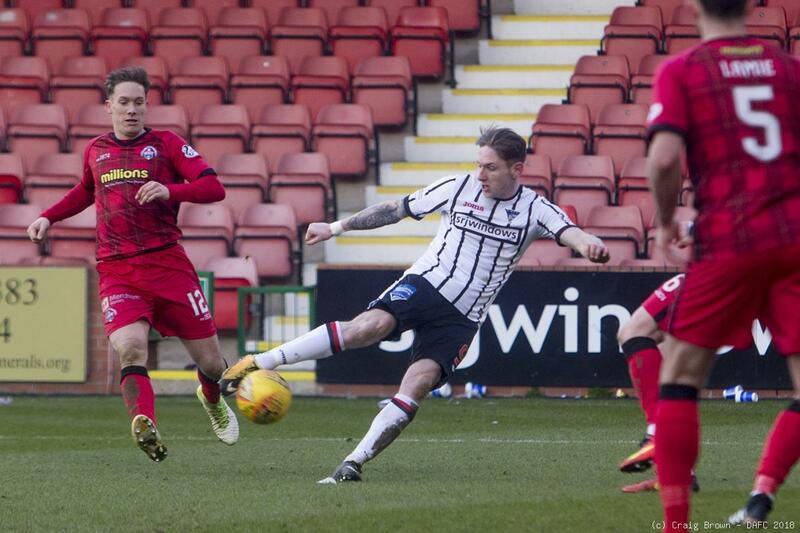 Twelve minutes into the second half and it was 1-1. 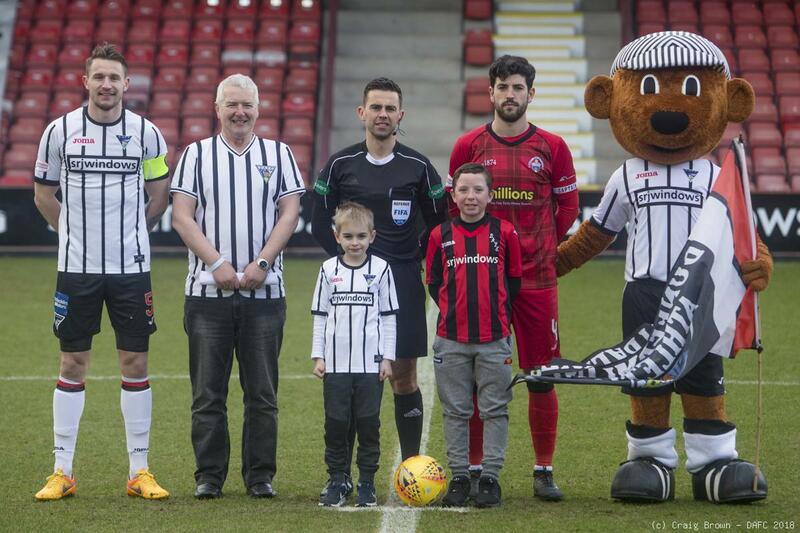 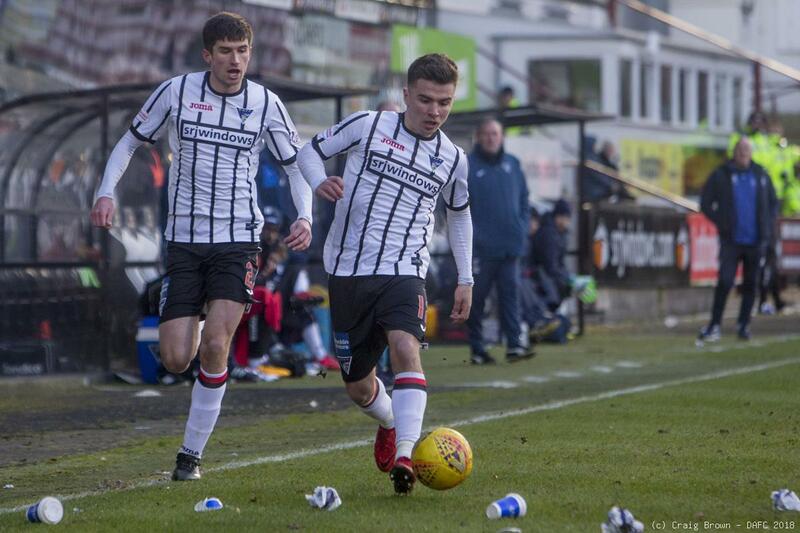 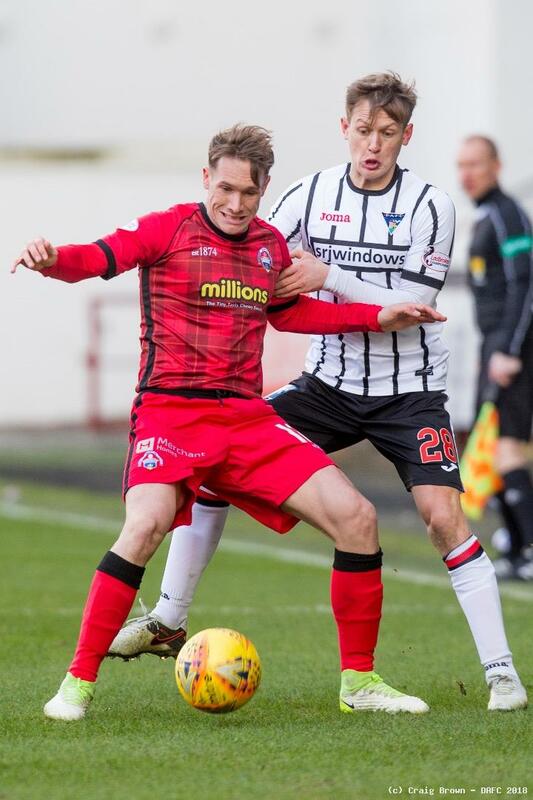 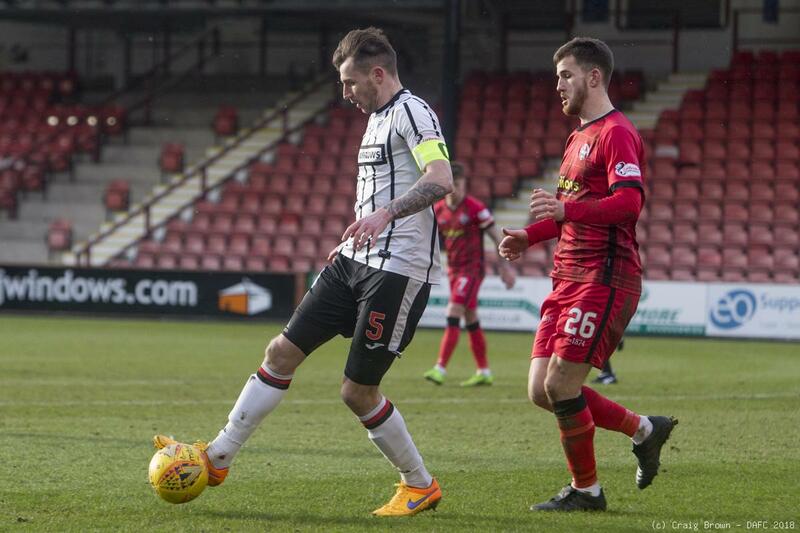 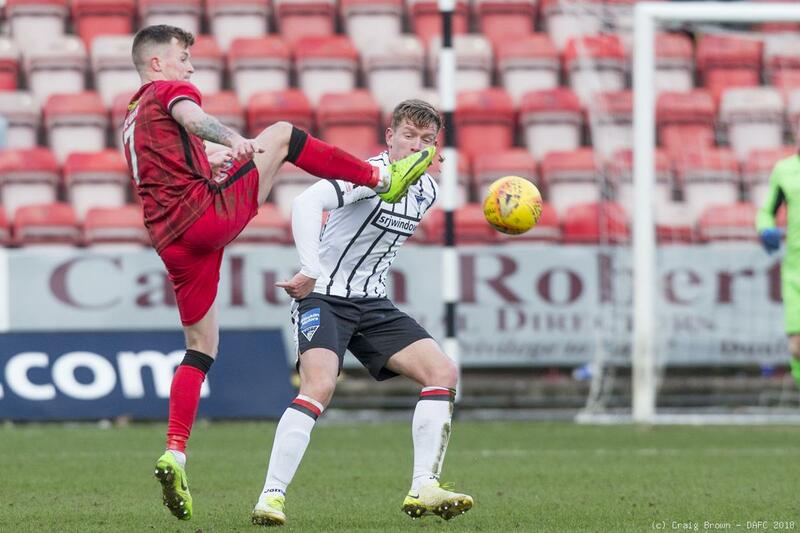 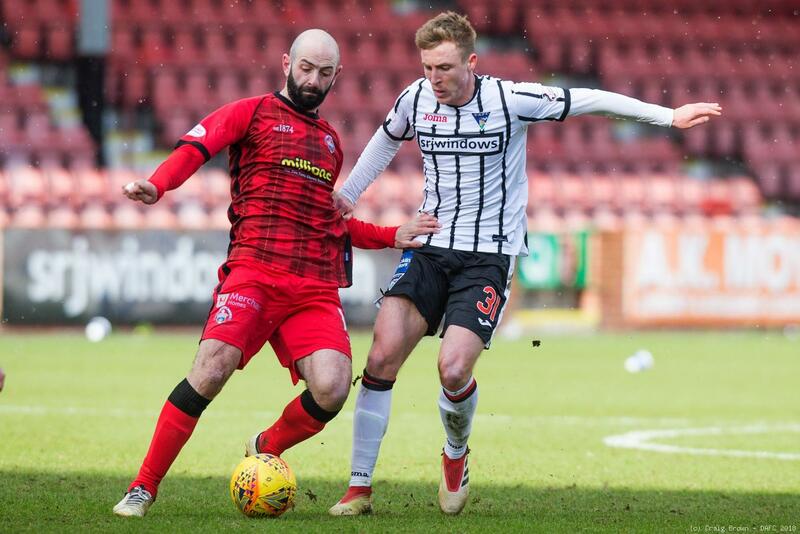 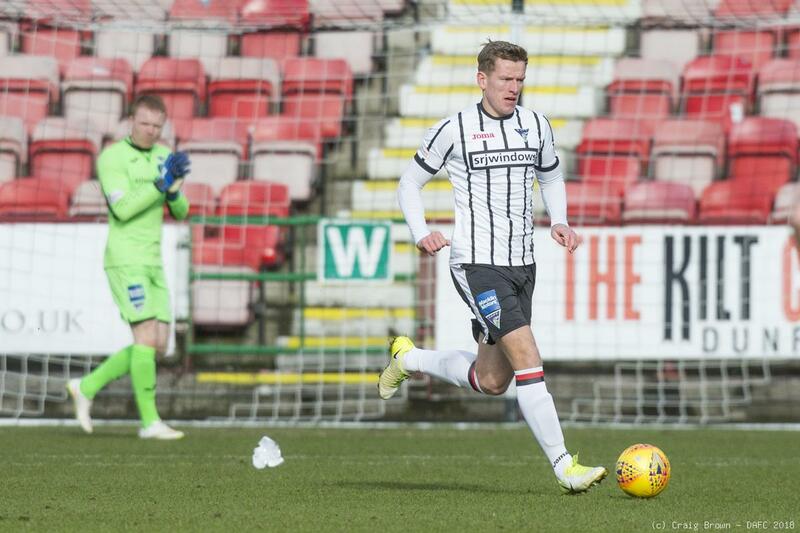 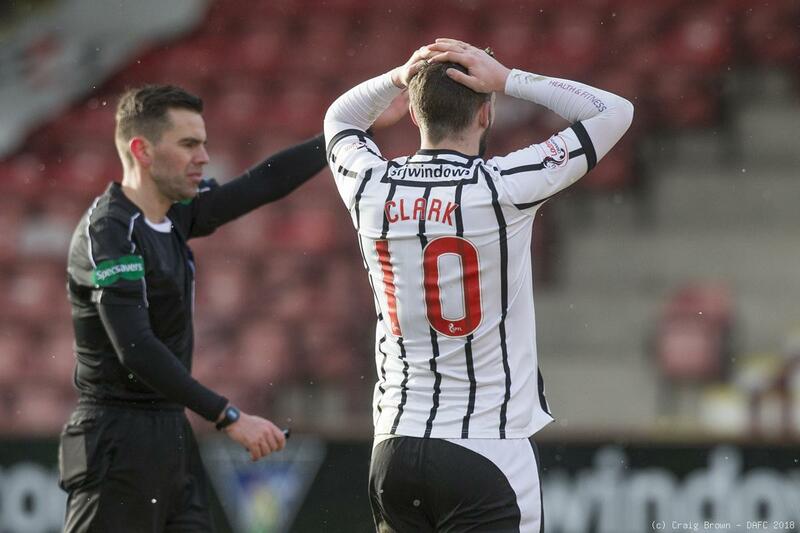 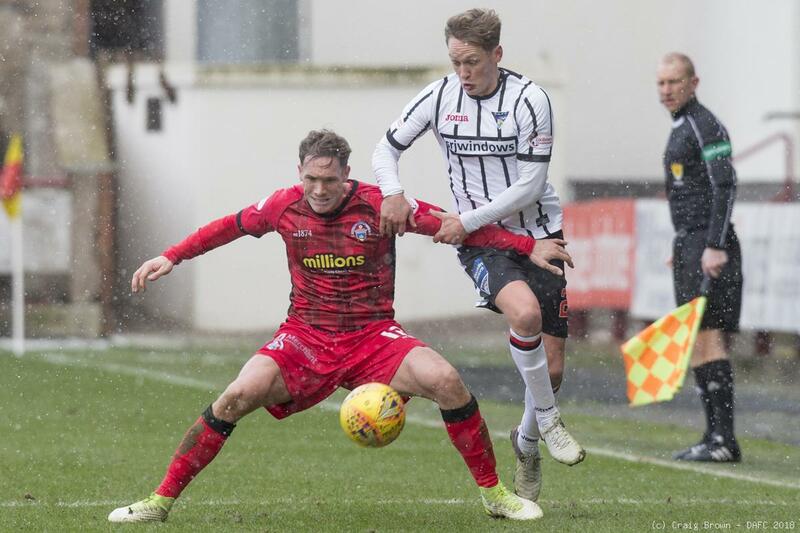 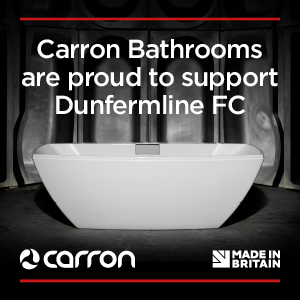 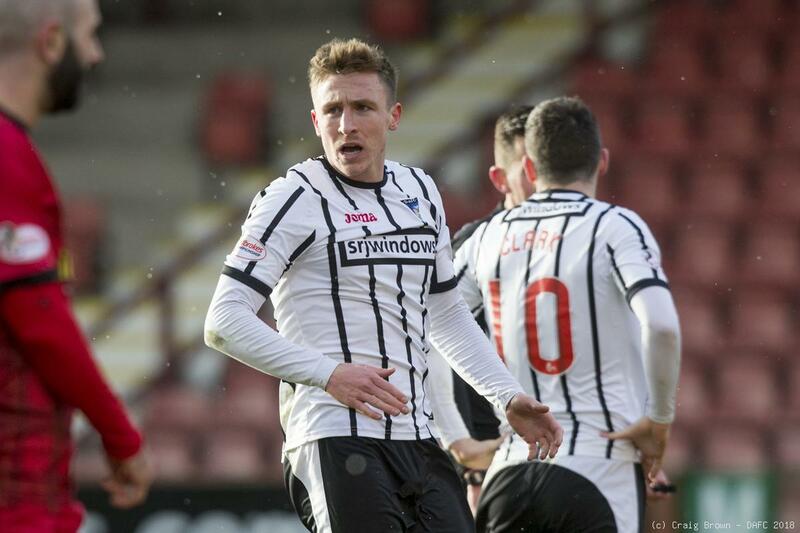 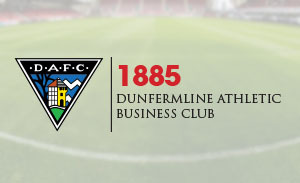 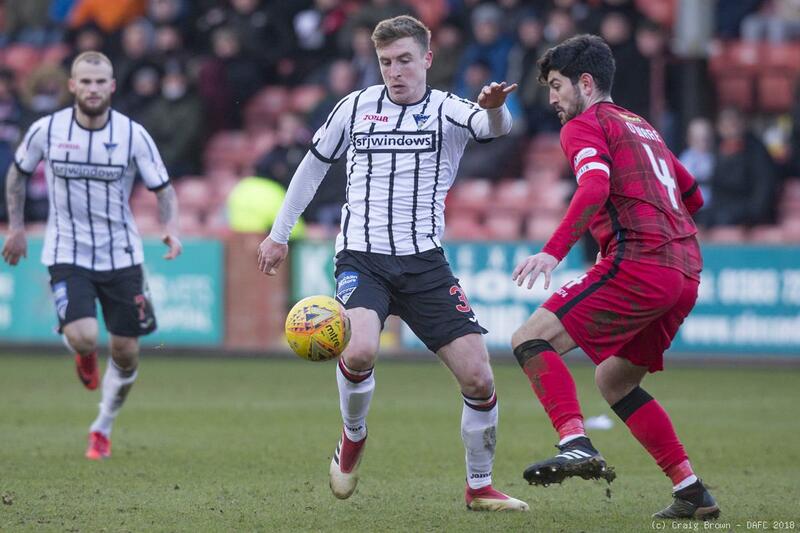 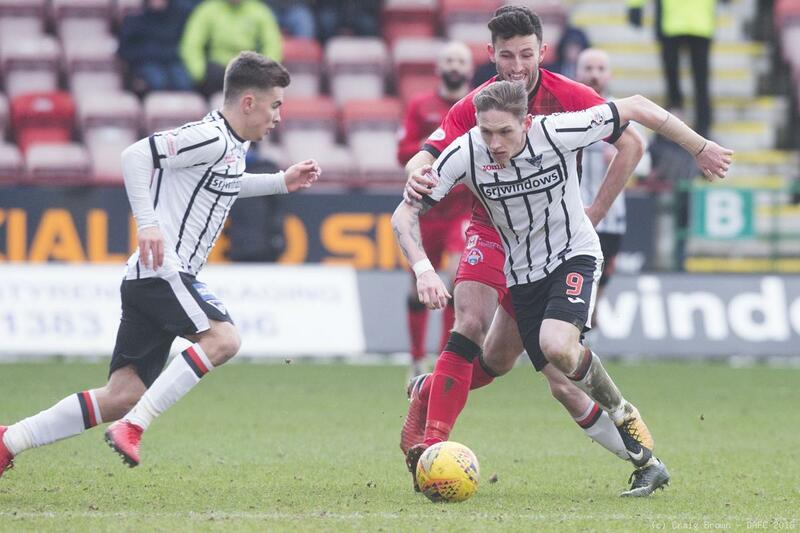 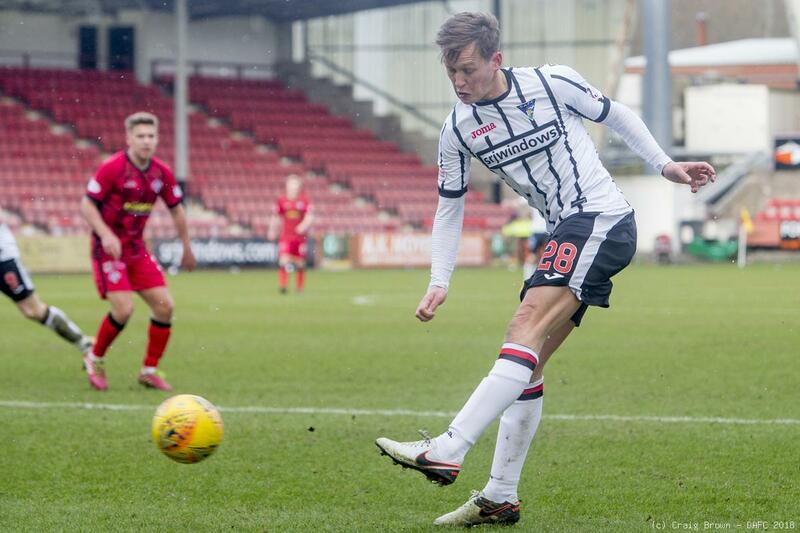 DUNFERMLINE: Lee Robinson: Ryan Williamson, Callum Morris (c), Jean Yves M`Voto, Jason Talbot: Michael Paton, Nat Wedderburn, Dean Shiels (James Craigen 66), Joe Cardle (Kallum Higginbotham 66): Nicky Clark, Declan McManus. 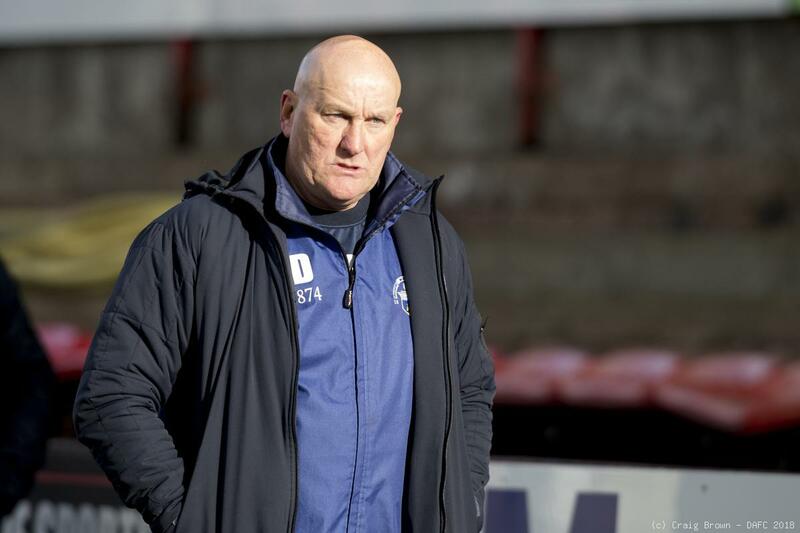 MORTON: Derek Gaston: Michael Doyle, Thomas O`Ware (c), Luca Gasparotto, Jack Iredale: Michael Tidser, Gary Harkins, Andy Murdoch, Frank Ross (Jai Quitongo 65): Scott Tiffoney (Mark Russell 90+4) Gary Oliver (Bob McHugh 90). 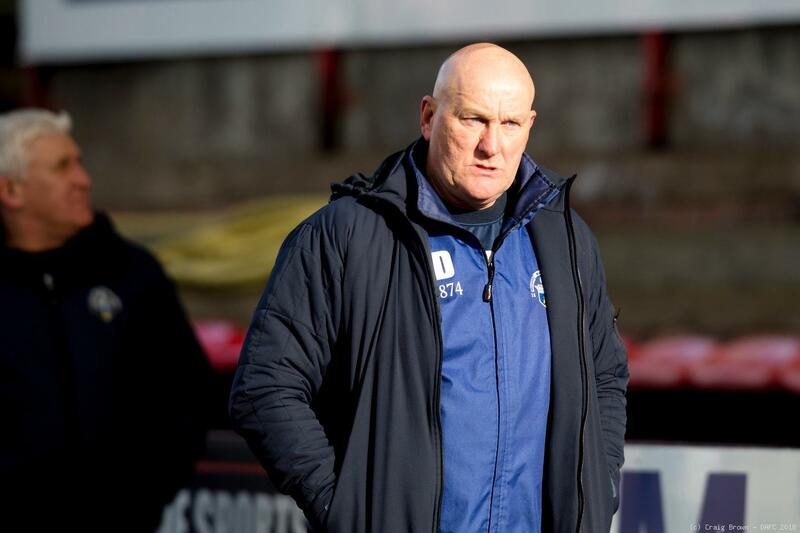 Morton have lost only twice away from home in this Championship season - against Dundee United in September and at Falkirk on 10 March. 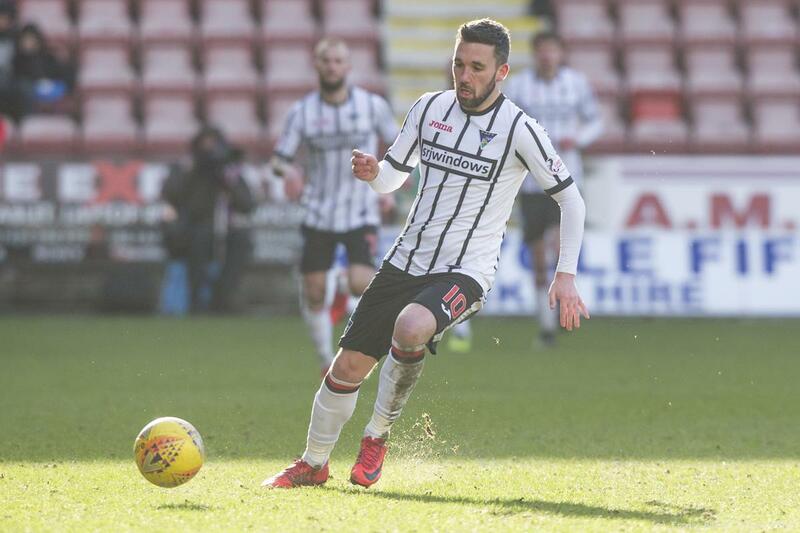 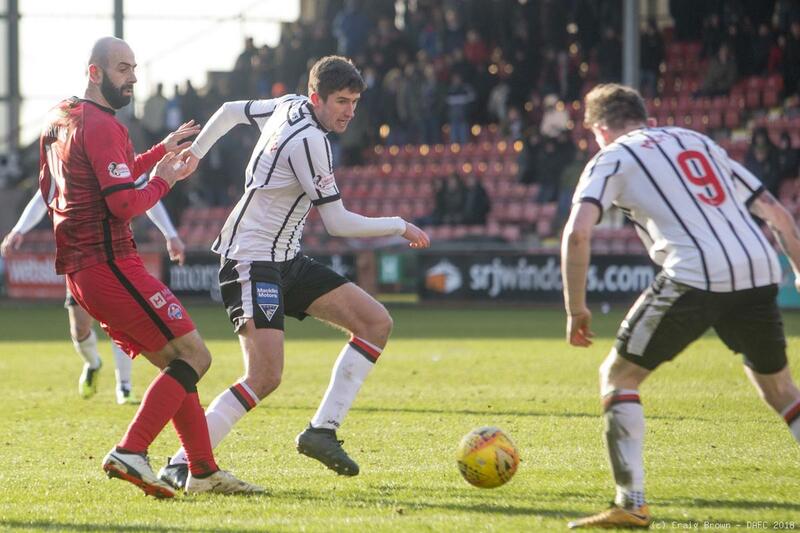 DUNFERMLINE (v Inverness CT)Lee Robinson: Ryan Williamson, Callum Morris (c) Lee Ashcroft, Lewis Martin: James Craigen, Tom Beadling, James Vincent, Kallum Higginbotham, Declan McManus, Nicky Clark. 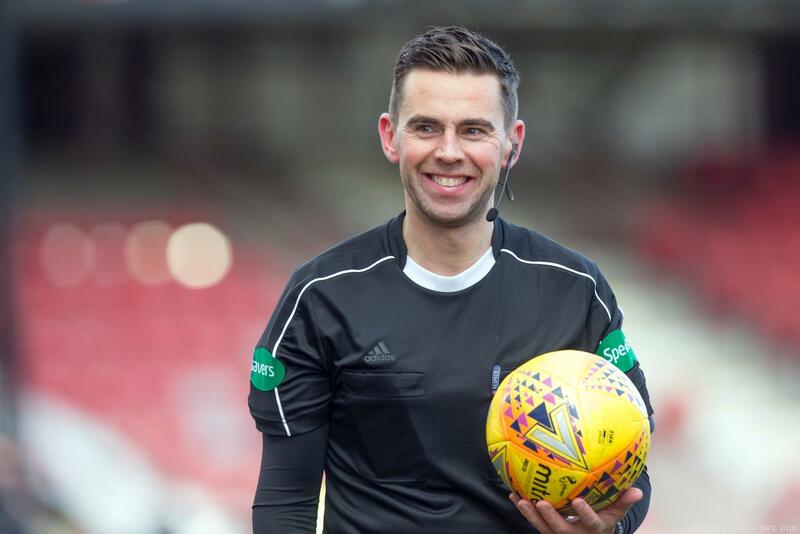 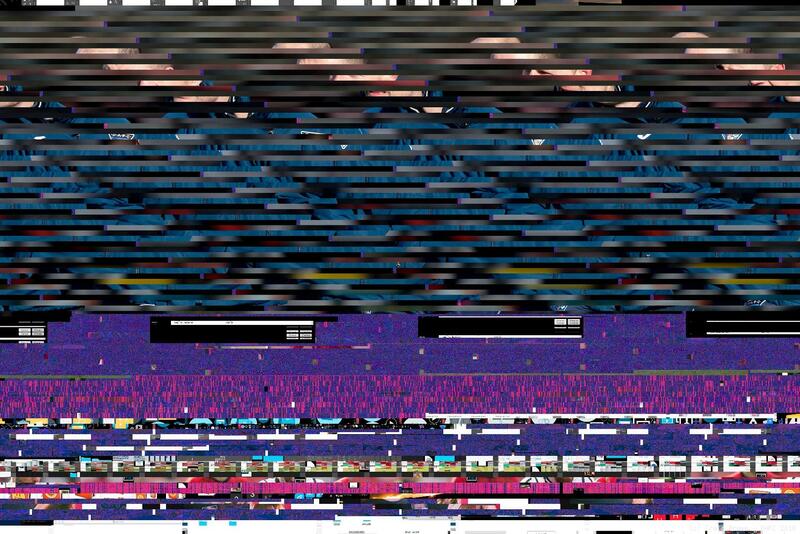 Referee will be Andrew Dallas.